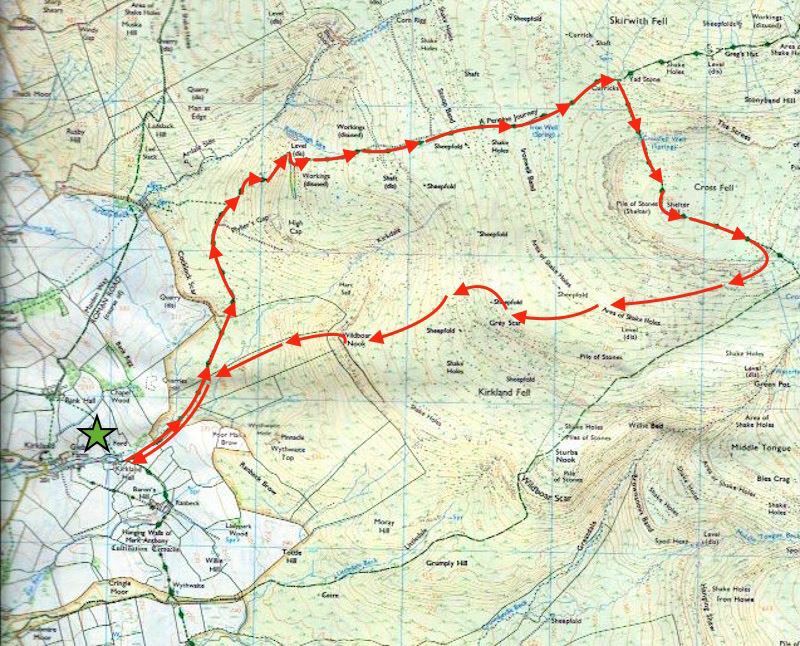 A walk up Cross Fell has been on the back burner for a while but its an outing which is best undertaken in really good weather. 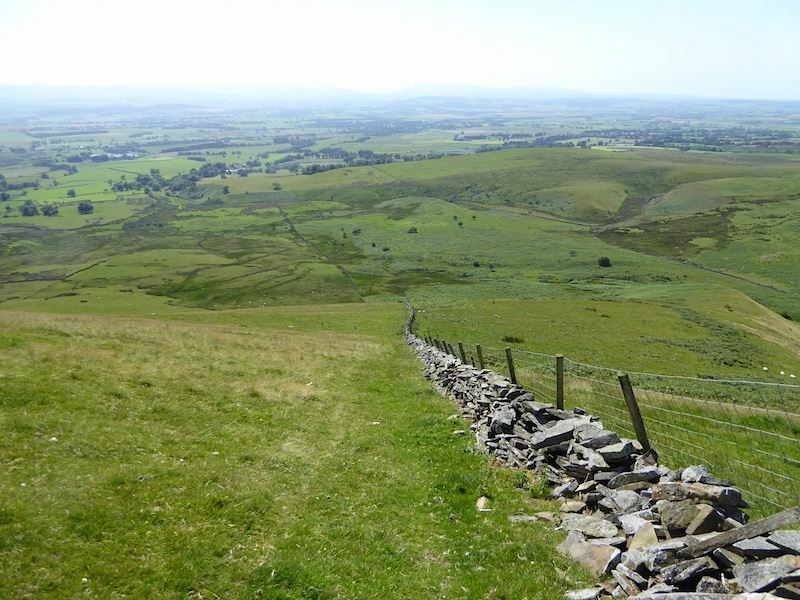 This fell rises up steeply from the eastern edge of the Eden Valley and from where we live, practically opposite it on the western side of the valley, it is generally in our view. Generally, rather than always, because quite a lot of the time cloud will be shrouding the summit. 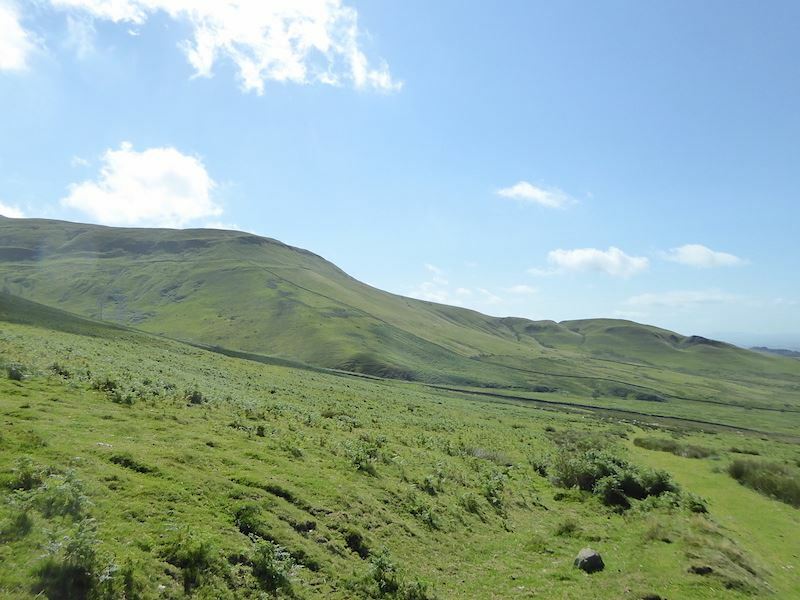 On many occasions the cloud will be right down to valley level and Cross Fell, together with the rest of its neighbours on the northern Pennine chain will be completely obliterated by it, sometimes for several days at a time. It is rare to see it totally cloud free so when I checked the Met. 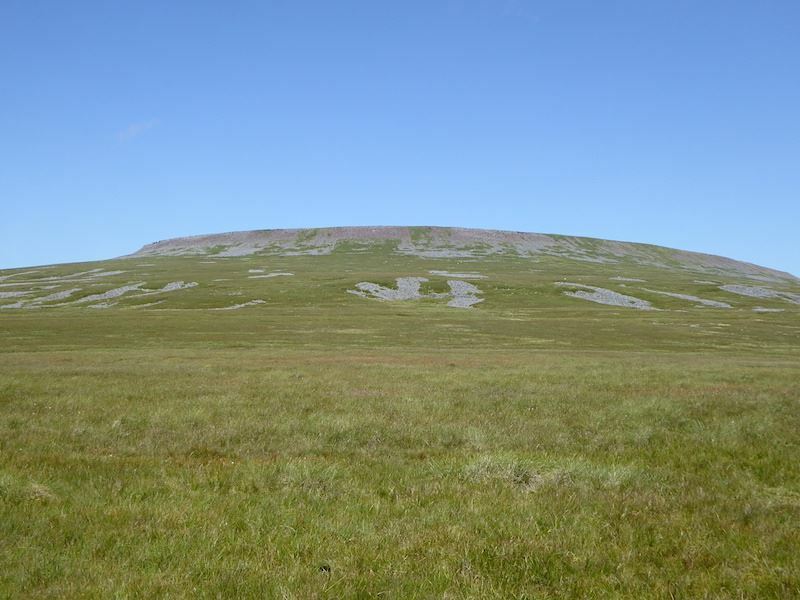 Office forecast for Cross Fell last night and saw a row of bright yellow sun symbols across the chart from 10.00 am onwards we immediately decided that today would be the day it came off the back burner. The forecast was as good as its word and we had a splendid walk in glorious weather. No need for an ultra early start as the little village of Kirkland is just a thirty minute drive from home. We wound our way along the narrow country lanes from our house, on several occasions having to squeeze ourselves into the hedgerows in order to accommodate cars driven by mums returning home from the morning school run. Eventually we meet up with the busy A66 and take a left turn on to it with no waiting for a gap in the traffic. It was a rather different when, a little further along, we needed to turn right to follow yet more narrow country roads leading us to Kirkland. Not school run traffic now but truck after truck after truck travelling eastwards. A gap in the traffic eventually materialised and we were able to lose ourselves in the quiet country lanes once again. On reaching Kirkland we drive straight up the road to the top of the village where the tarmac ends and a rough farm track begins. Here, just beyond the last couple of houses in the village, is a small parking area which will hold about four or five sensibly parked cars. The shot above was taken from that parking area and shows the beginning of the rough track and the start of today’s walk. Just around the corner the track passes through this tree lined section giving us some welcome shade from the glare of the sun. 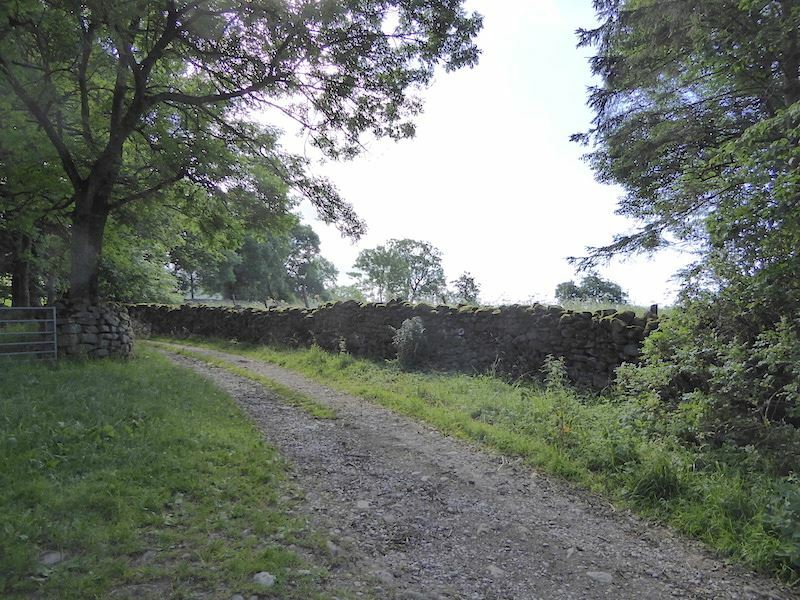 The old wall is covered in moss and looks as though it hasn’t seen the sun in years, and there’s the familiar sweet scent of damp grass and hedgerow foliage. We notice the clouds up ahead but are confident that they will burn off as the day heats up. 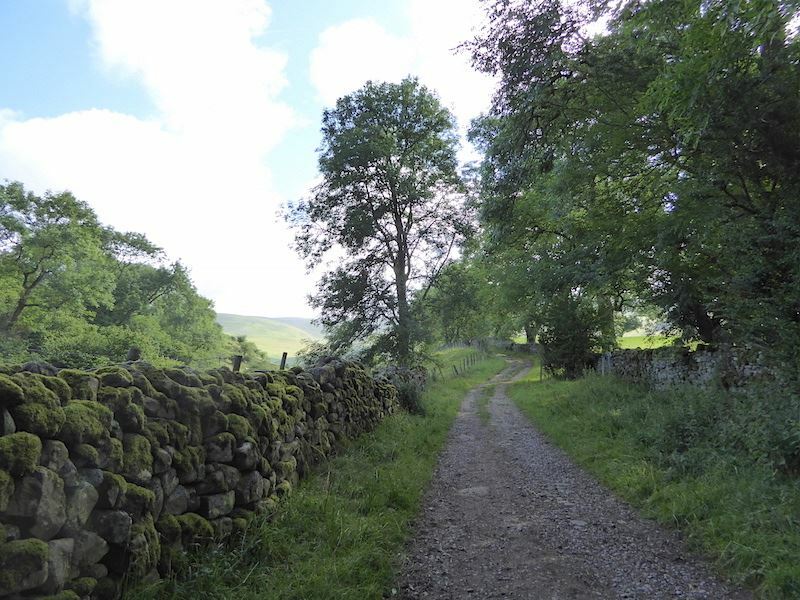 The rough farm track eventually gives way to a grassy bridleway which is a whole lot easier on the feet and takes us across the open countryside with Kirkland Beck, in the gully on the left, gurgling its way back down to the village. There is stillness and silence broken only occasionally by the bleat of a lamb or a skylark chirruping high above us. 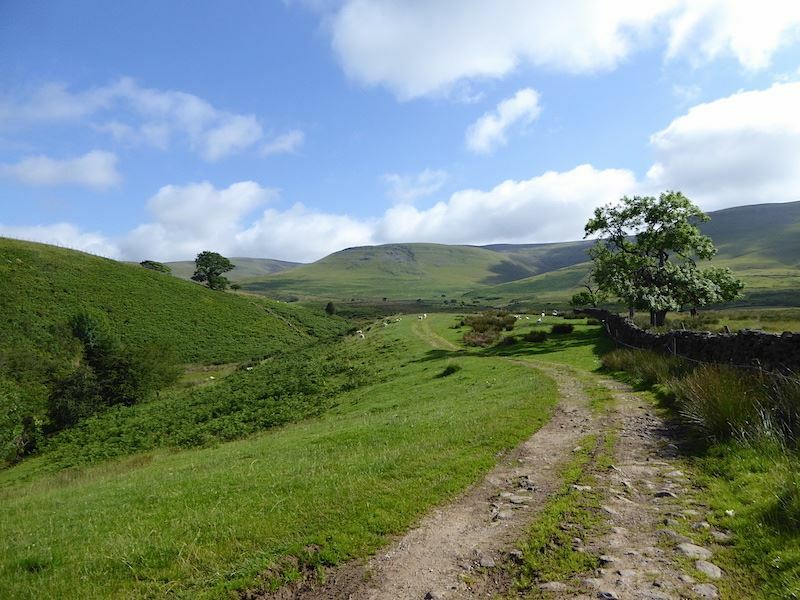 The bridleway stretches out before us and up ahead we begin to have uninterrupted views of today’s objective, Cross Fell. 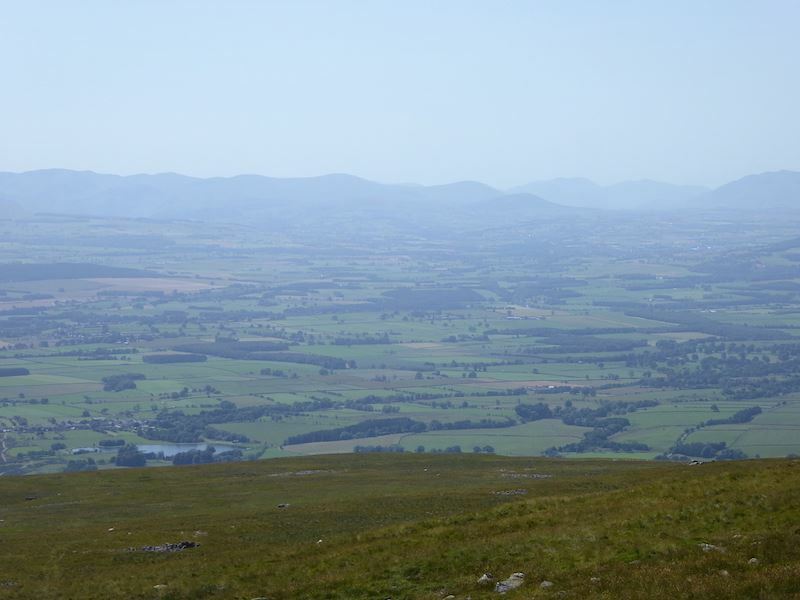 The two hills on the skyline are not separate entities, but form part of the enormous bulk of Cross Fell, and there’s a part of it over on the right which I couldn’t fit into the shot. 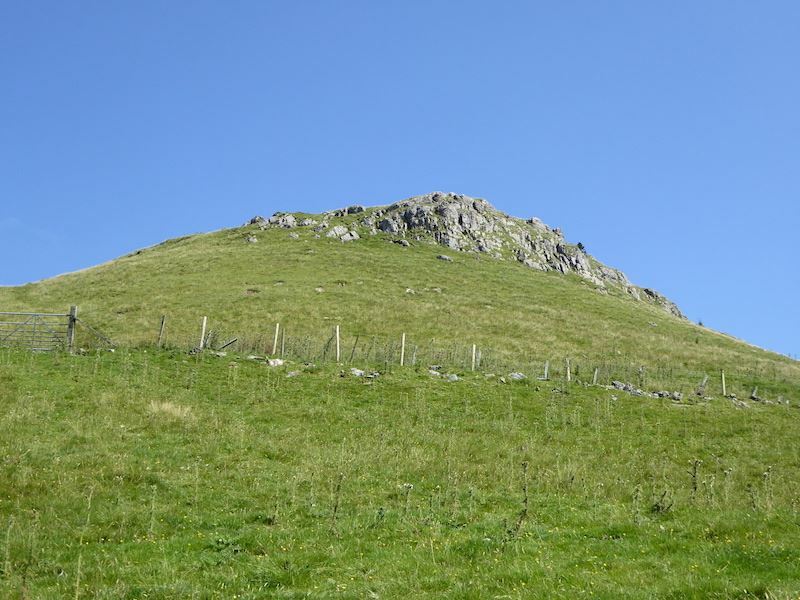 It is a huge beast of a fell and the summit is out of sight at the moment as its tucked way, way back behind the high ground to the right of centre. We have quite a way to go before we’ll even get sight of the summit. 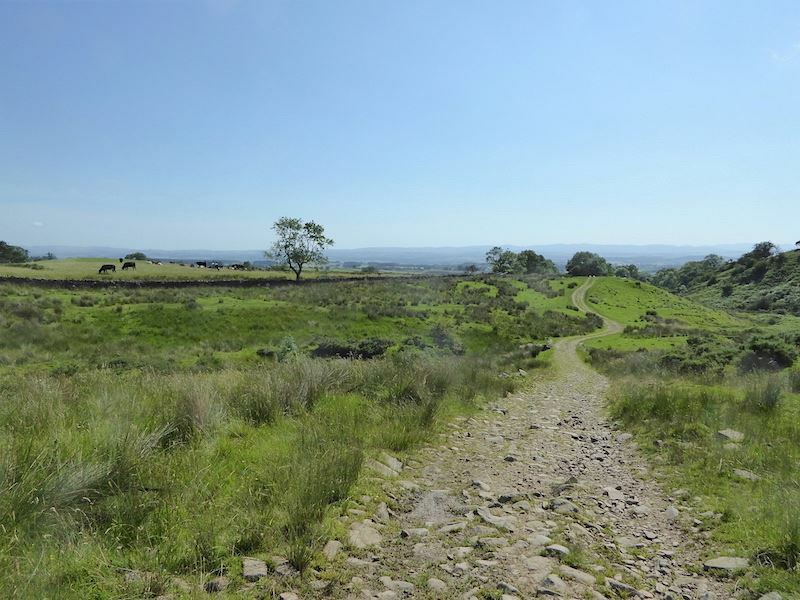 We will walk up around the back of the hillside on the left and then from the top of it travel eastwards to the left of, and well beyond, the flattish area above Kirkdale which is on the skyline between the two hill sides. 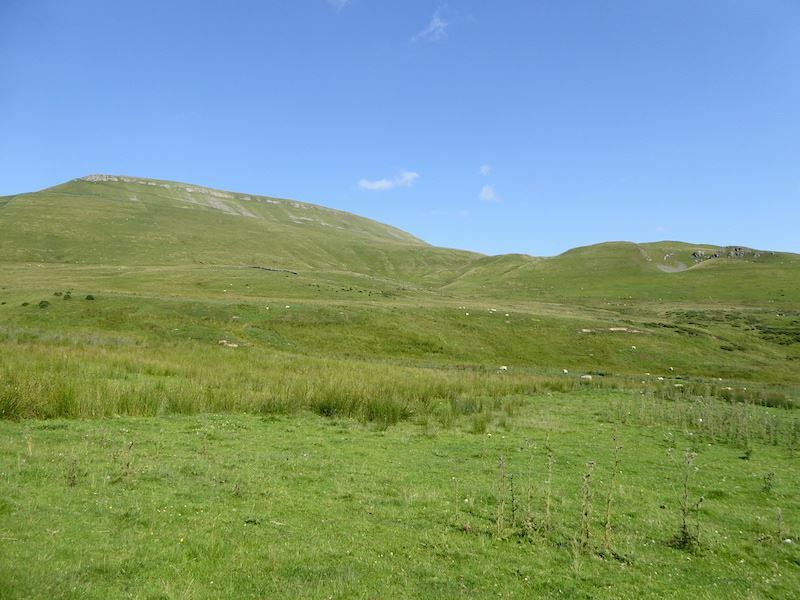 On the left of the huge bulk of Cross Fell its neighbours on the north Pennine chain are rolling their way along the skyline like a long green wave. The clouds haven’t dissipated yet but they are breaking up quite nicely and it looks as though the Met. Office forecast for clear skies by 10.00 am could well be spot on. The morning was warming up quite nicely so, before we passed through the gate behind us, off came the jumpers and I took a look back along the bridleway and across the Eden Valley. There is almost no cloud over there now but, unfortunately, there is quite a bit of heat haze so we won’t have the best of long distance views today. 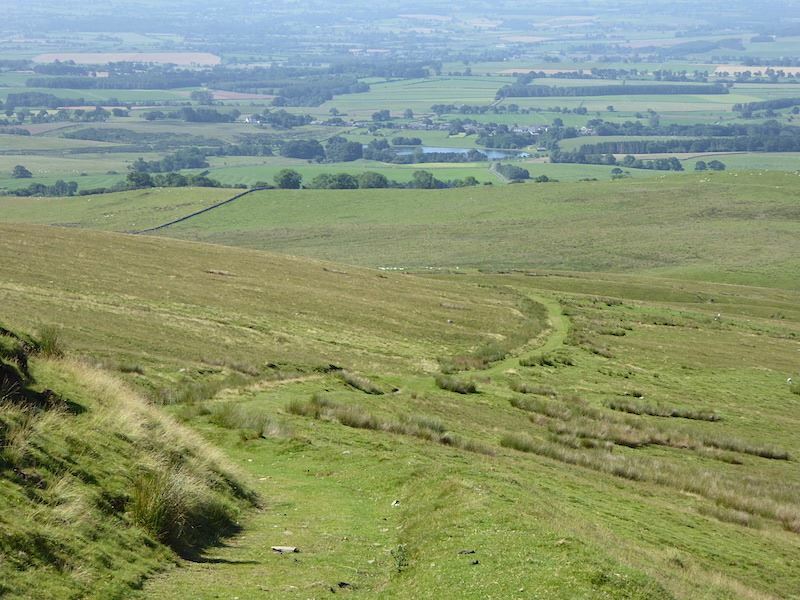 Like the Pied Piper, the bridleway draws us on towards High Cap at the north western end of Cross Fell. Behind us the south eastern arm of Cross Fell drops down to the Eden Valley in a dramatic sweep from Wildboar Scar to Grumply Hill. An escarpment with the name Wildboar needs little working out but Grumply Hill? How did that originate? Visions of tetchy travellers in hob nailed boots and sporting long white beards hauling themselves up it in days gone by, and being a tad grumply about it while they did so, spring to mind. 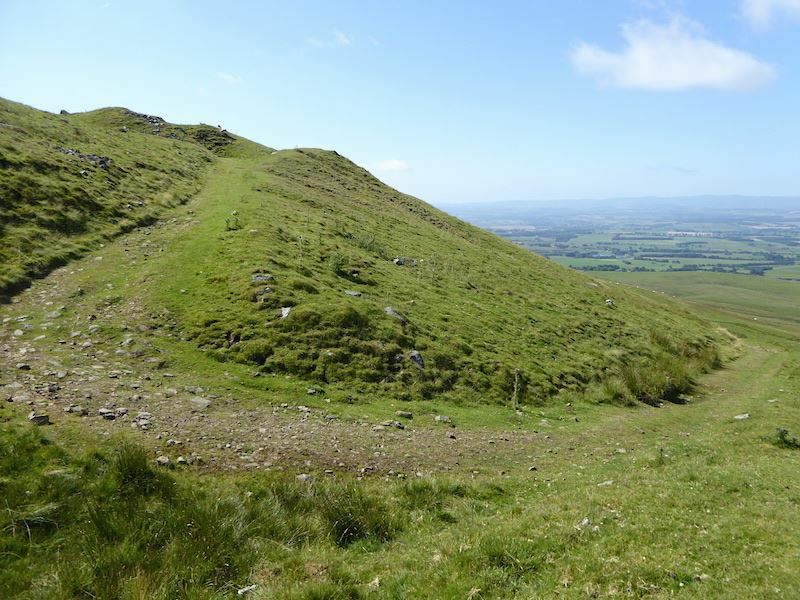 There are some wonderful names for some of the other humps and bumps too, Sturba Nook above Wildboar Scar and Tottle Hill just below Grumply Hill are another couple of the intriguing names noted on the map. 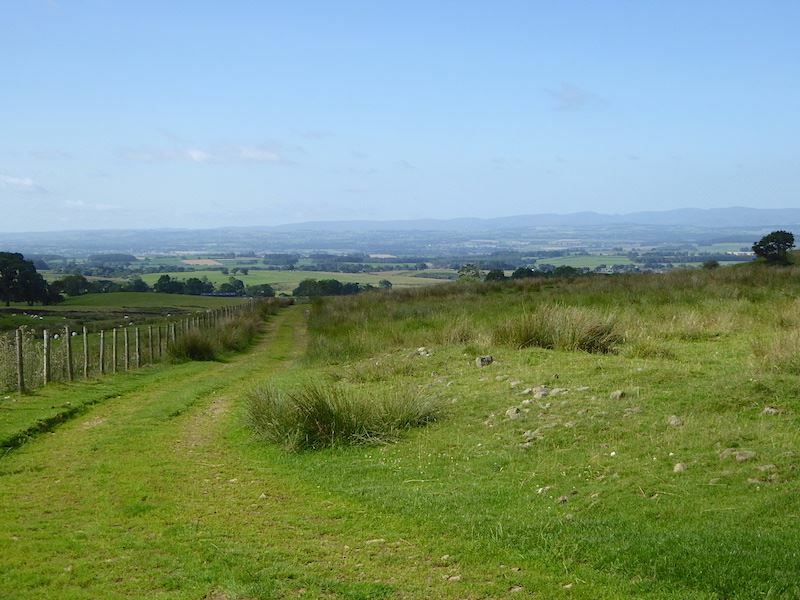 The bridleway begins to curve its way up and around the north side of High Cap and behind us is …..
….. the view across the Eden Valley to Penrith and all the way along to the Vale of Keswick. In the murk we could make out Clough Head, over on the left with Great Mell Fell just in front of it, and Blencathra over on the right. 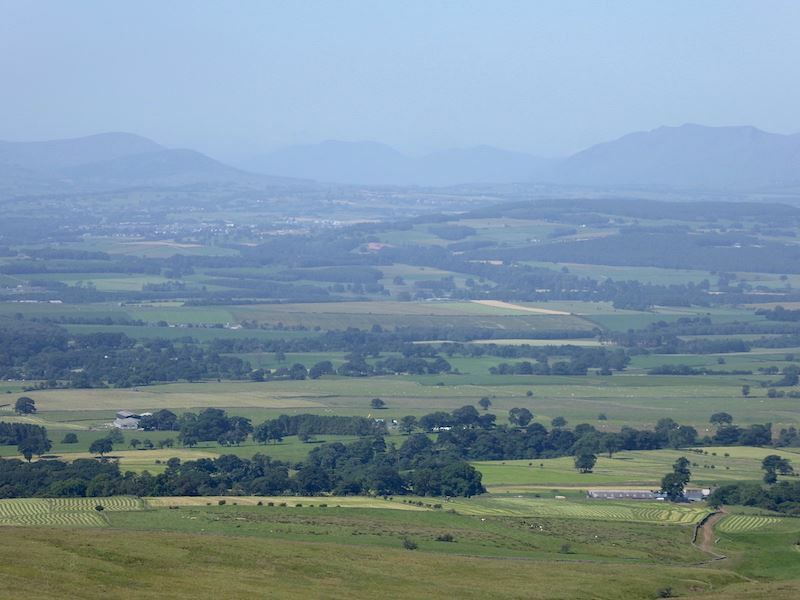 If you zoom in on the fields below us you might just be able to pick out a farmer in his tractor turning the fields into bright green humbugs as he makes hay. 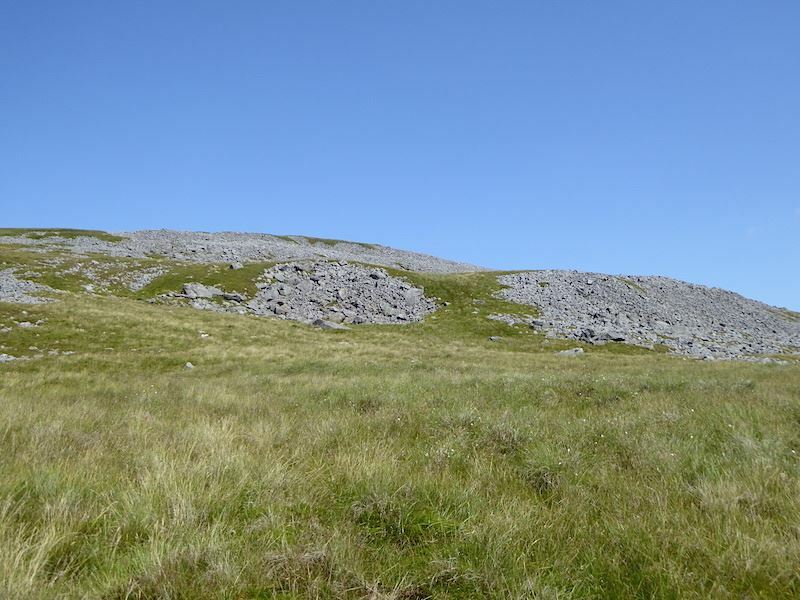 The gentle gradient disappears as the path begins to rise more steeply around the side of High Cap. 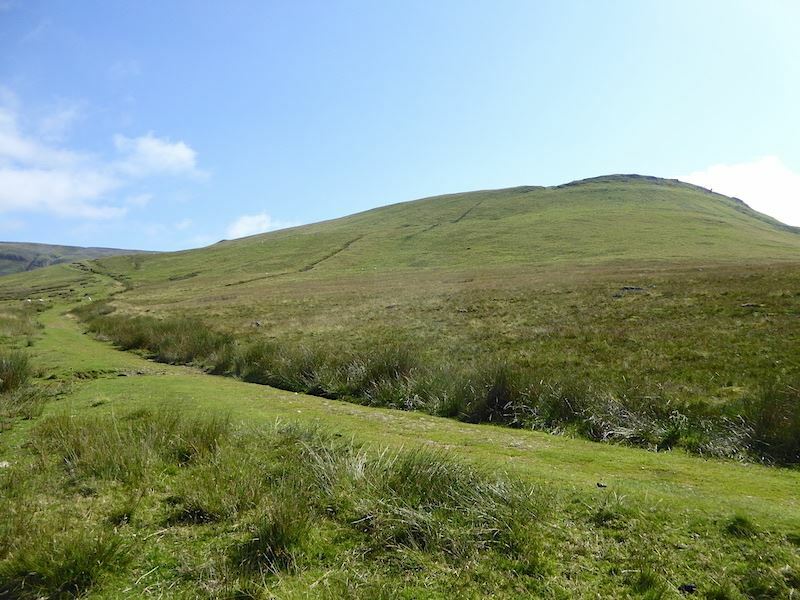 The blue patch in the shot is Blencarn Lake where you can indulge in a spot of fly fishing for rainbow trout after first obtaining a fishing permit from the owner in Blencarn village. We had to pass through the village on the way to Kirkland and noticed the prominent ‘Fishing Tickets’ sign outside the house. Further along the road is the lake and for anyone hooked on fishing (the obvious pun might elicit a groan at this point so please feel free) it looked a lovely place to spend a day like today. 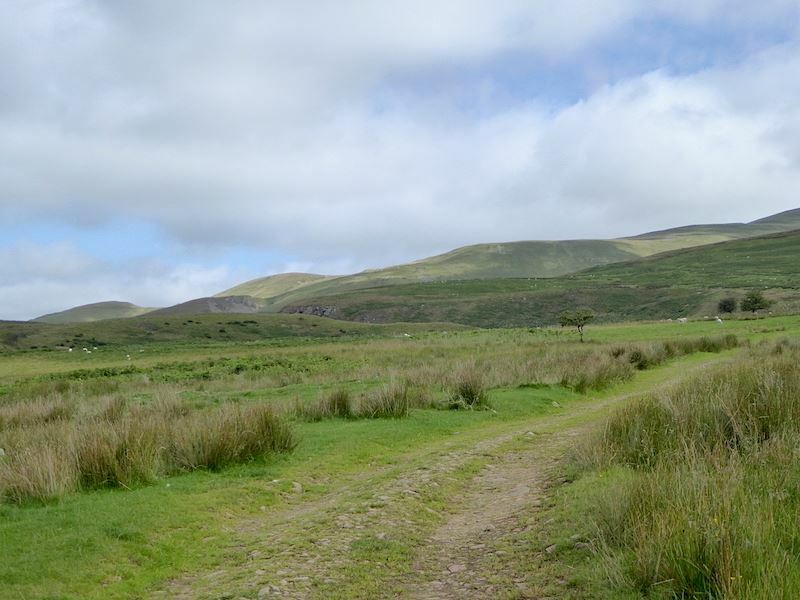 The north Pennines form a dramatic backdrop to the spring fed lake and its surroundings, which the owner keeps in beautiful condition and well stocked with rainbow trout which is reared on site. 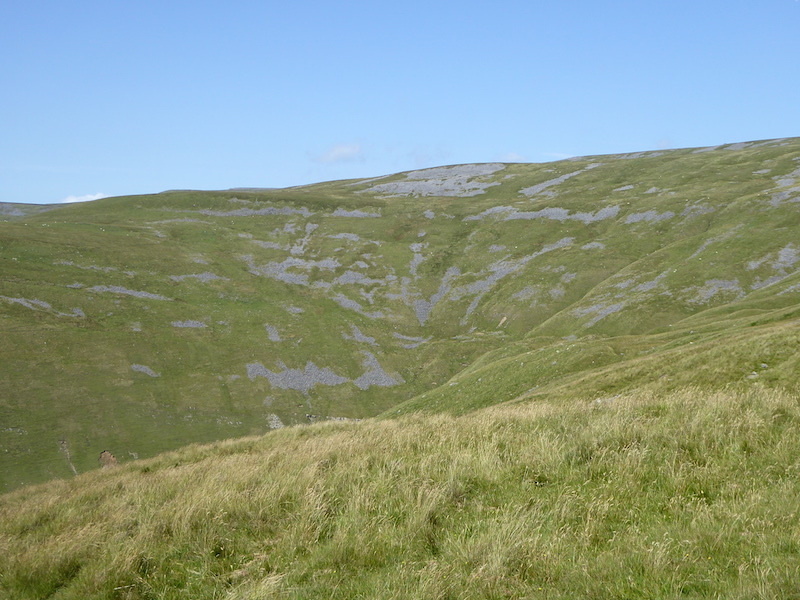 Across Ardale Beck I spotted this sheepfold on the slopes of the hill opposite, the wonderfully named Man at Edge. Zoom in and you might be able to make out the herd of cows on the skyline directly above the sheepfold. An unusual place to find cows but there they were mooing loudly to each other just as they do in fields at valley level and so seemed contented enough. From the same viewpoint I turned the camera a little to my right for this view up to the head of the valley which has yet another thought provoking name, Black Doors. That wall of rock just below the centre skyline is certainly dark enough in appearance to merit being called black and it definitely looks as though there is at least one gaping dark hole in it so its a door of sorts. Maybe a cave or an old mine adit and perhaps there are more such holes in the rock which can’t be seen from here. Apart from those few tenuous thought I couldn’t come up with any further suggestions as to why it is called Black Doors. Another intriguing name too for the beck flowing down from the right into Ardale Beck, this beck being known as Gregory’s Sike. A sike is just a stream which flows through marshy ground but I have no idea who Gregory was or why he had a stream named after him. Still mulling over the preponderance of obscure and puzzling names we carry on along the bridleway which continues snaking its way up and around the back of High Cap. The gradient has eased slightly again but its still enough of a rise to make it very warm work in the full glare of the sun. These long steady climbs can sometimes be more energy sapping than the shorter but steeper ones. Short and steep is suffering concentrated but long and gradual is suffering prolonged, either way its always a relief to get to the end of it, and looking ahead it seems that the end of this particular section isn’t all that far away. 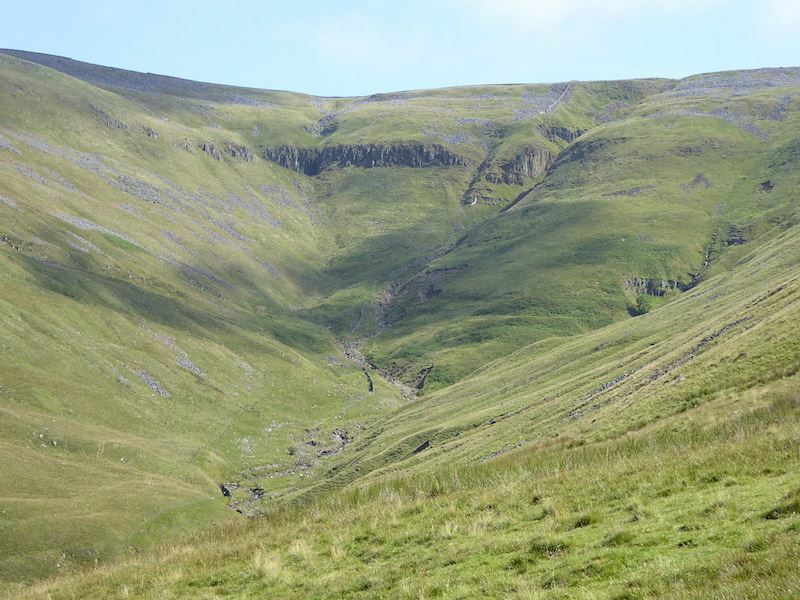 A quick peep down reveals the meandering course of Ardale Beck below Man at Edge. Right now the other team member is almost a man on the edge because this last little rise is one of those short but very steep ones which are playing havoc with his foot and calf muscles. A patch of level ground and a chance to relax the legs for a minute before we round the bend and walk up the slope to the bumps and hollows of some long abandoned mine workings. You can see a couple of the bumps over on the top left of the photo. 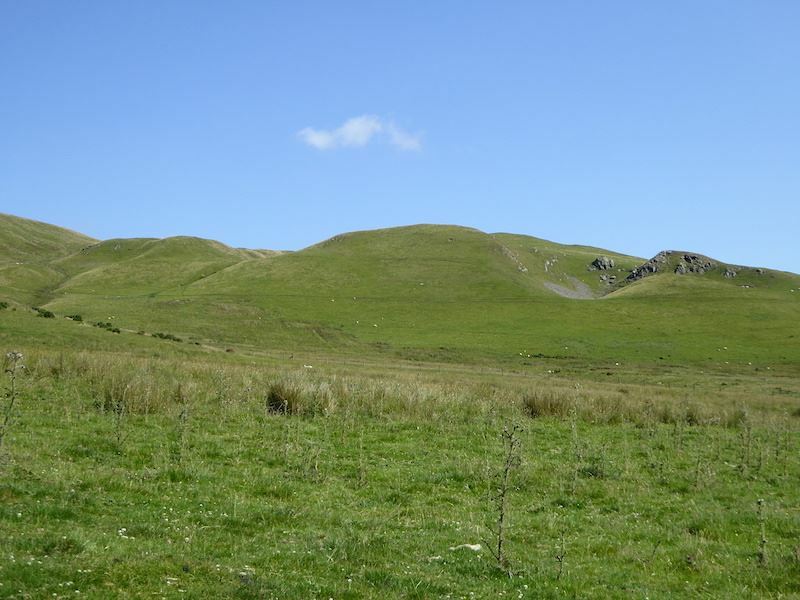 The area is marked on the map as Level (disused) and Workings (disused) and so long have they been disused that it is almost impossible to tell that the humps and hollows are the result of human activity. Everything has been reclaimed by nature, grass covers everything with only an occasional mound of stones poking through it. 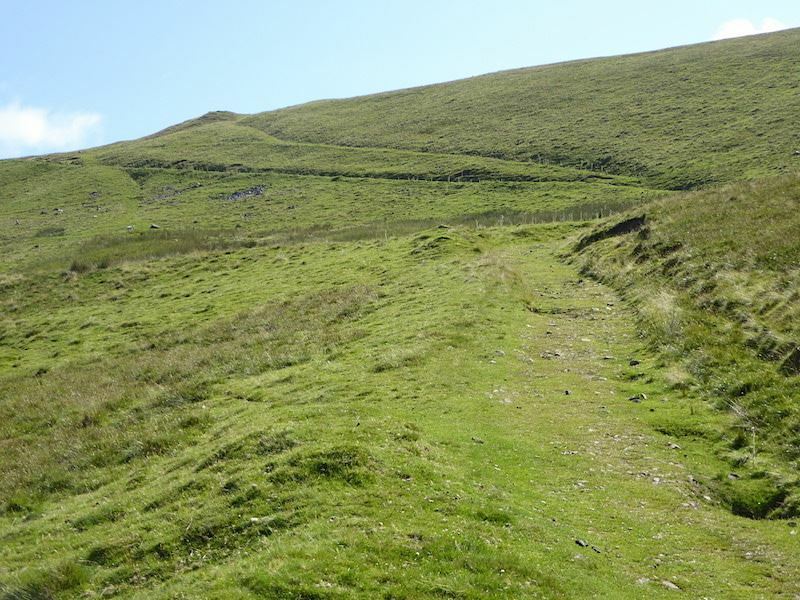 I would imagine that the track which is now termed a bridleway would once have been the access route to the mine for horse drawn carts from the way it is graded. What was being mined remains a mystery to me, I suppose it would have been anything with some commercial value which could be dug out of the ground to provide men and their families with a living. 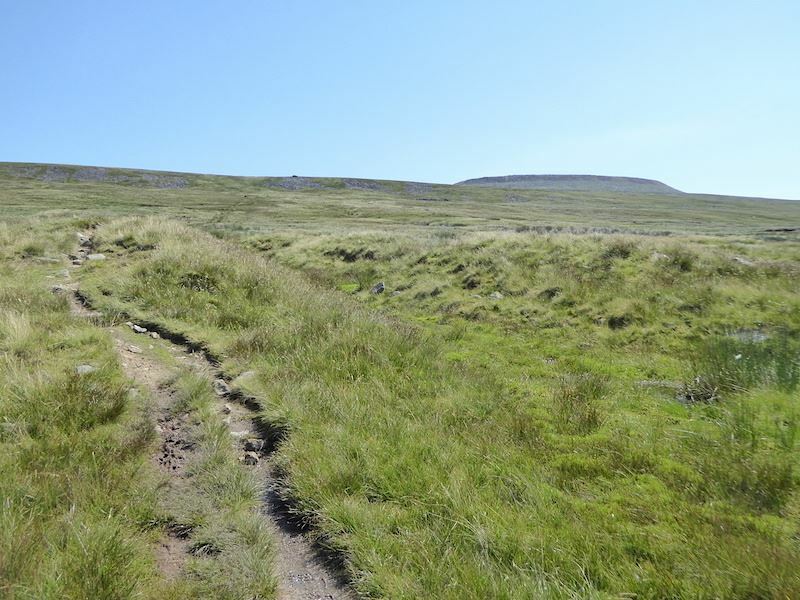 Presumably there was no good reason for the bridleway to continue beyond the disused workings, so from that point it dwindles to this narrow path which heads roughly east across the open moorland towards the squat summit of Cross Fell. Its a cloud free and spirit lifting sight but its much further away than it looks and there’s a whole lot of boggy stuff to wallow through before we get anywhere near it. 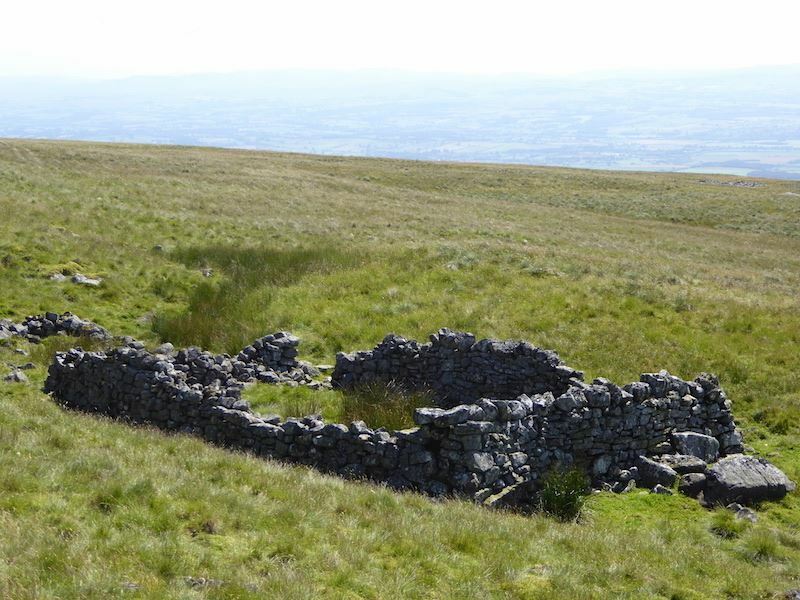 We pick our way across the largely featureless landscape but we do occasionally come across signs of human activity such as this long abandoned and now derelict sheepfold. The white and brown blobs you can see towards the rim of the grass are more cows happily chewing away on whatever took their fancy and taking absolutely no notice of either of us. They looked like any other cows you might see in any of the fields down below in the Eden Valley so maybe this is just their summer pasture and they will be brought back down to the valley before the winter sets in again. They certainly didn’t look like a specially hardy breed which could tough it out up here all winter. 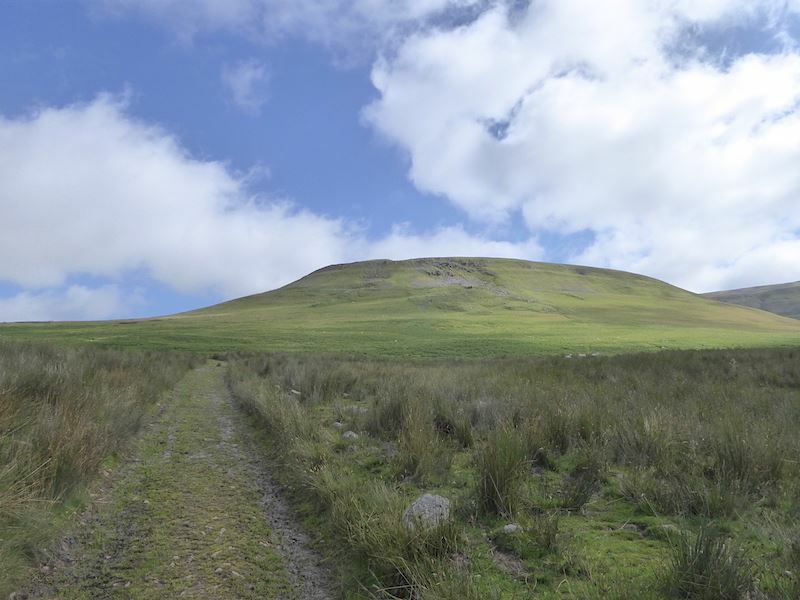 It is probably obvious by now why a clear day is needed to walk on Cross Fell. 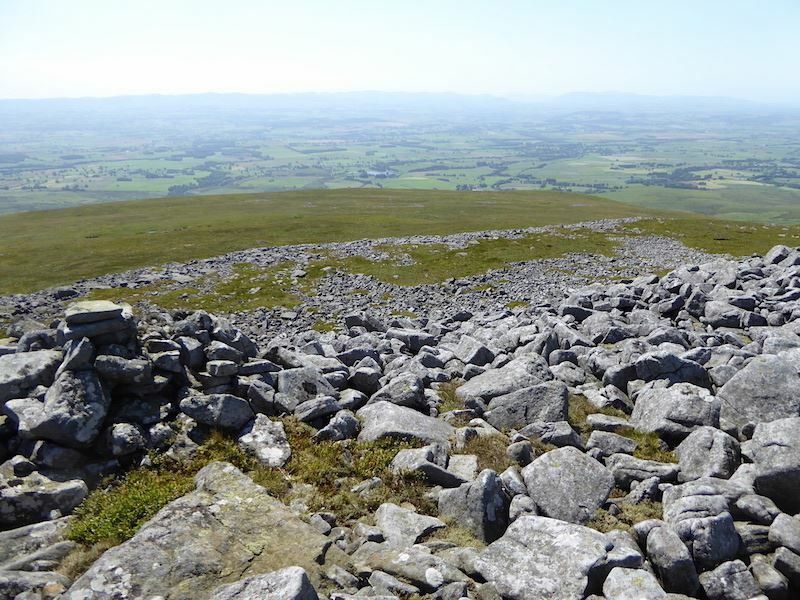 There is little to guide you over the featureless moorland with its extensive wet/boggy areas and numerous boulder fields, even the summit has disappeared temporarily behind the slope we are climbing. 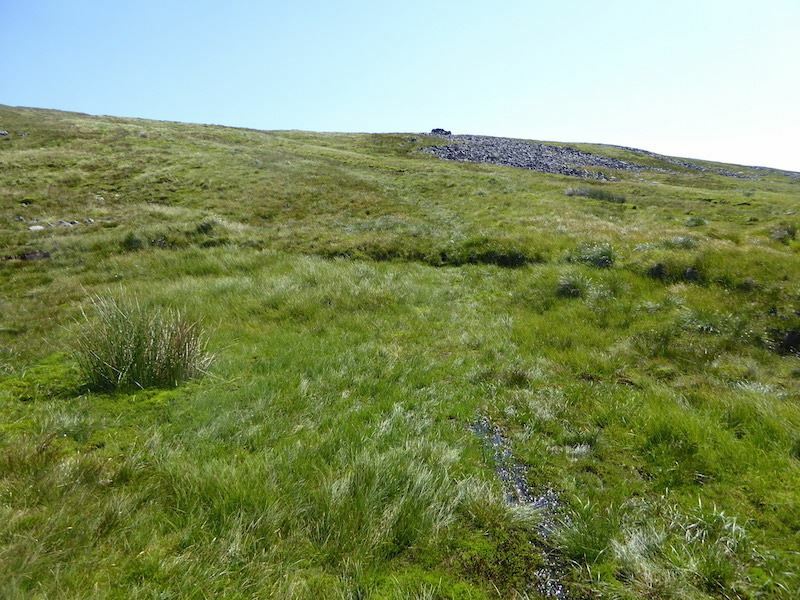 The path across this middle section was nothing more than a line of flattened vegetation which was easily lost if diversions had to be made to avoid the very wettest of areas. In strong winds, driving rain or low cloud navigation would be difficult and it would be pretty miserable up here, especially as there is nothing much by way of shelter until the summit is reached. 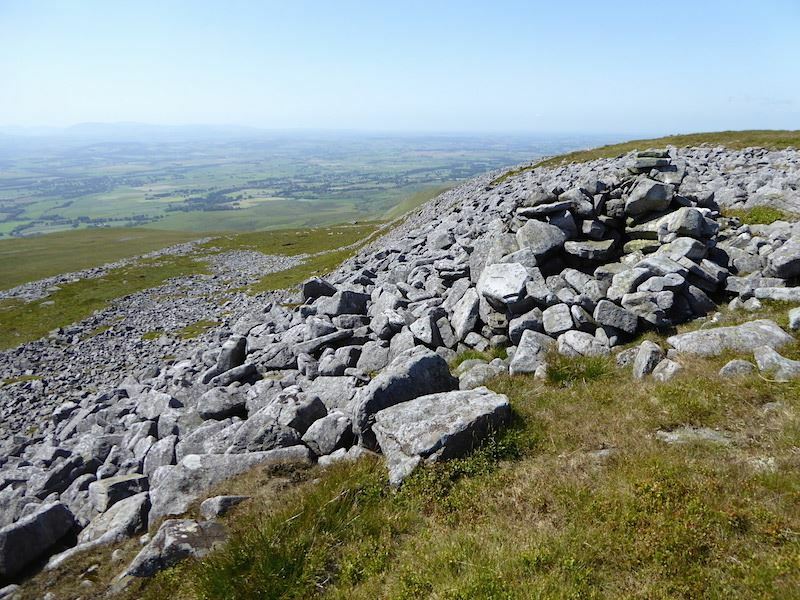 Dotted infrequently, here and there, are small mounds of stones, which looked like evidence of past attempts by walkers to provide themselves with a little shelter from whatever appalling weather state they found themselves experiencing. 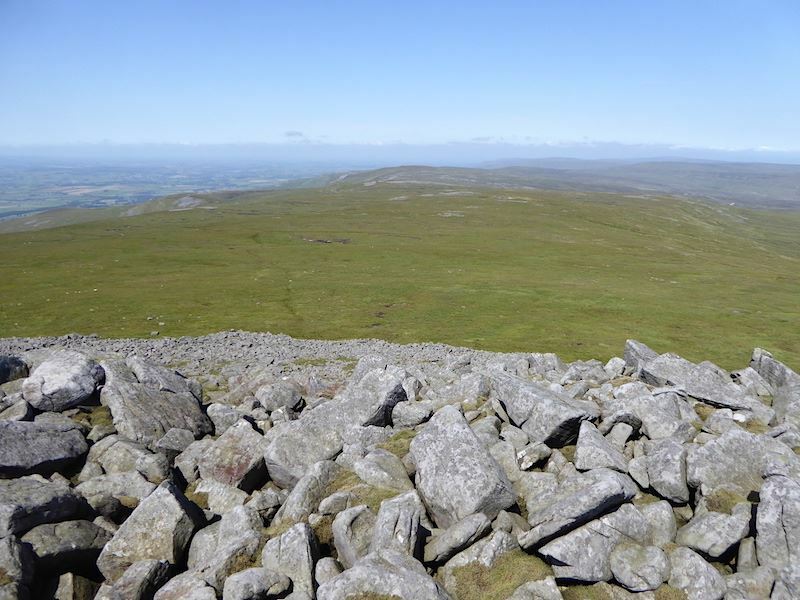 Cross Fell summit comes back into view but its not as near to us as it seems, this is a close up shot to give a view of the boulder field guarding the perimeter of the summit. Now back on to the actual view which shows just how far away the summit still is. Of course it wouldn’t take too long to get there were the conditions underfoot anything like reasonable, but in many places they aren’t and this is just one of them. This peat hag looked dryish and firmish but we weren’t going to chance it and it was easy enough just to skirt round it and hop from one grassy clump to the next. 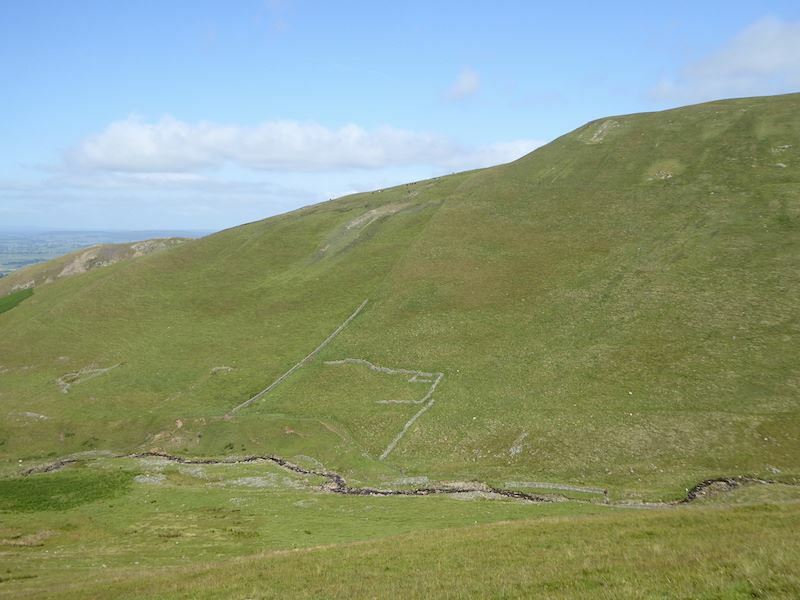 This was another place where the path went AWOL so all we could do was keep that summit in view and head towards it knowing that eventually we would meet up with the Pennine Way path a short distance below Cross Fell’s boulder field perimeter. After a great deal of splashing, squelching and occasional cursing we make it across and have the bliss of a firm wide track beneath our feet again. 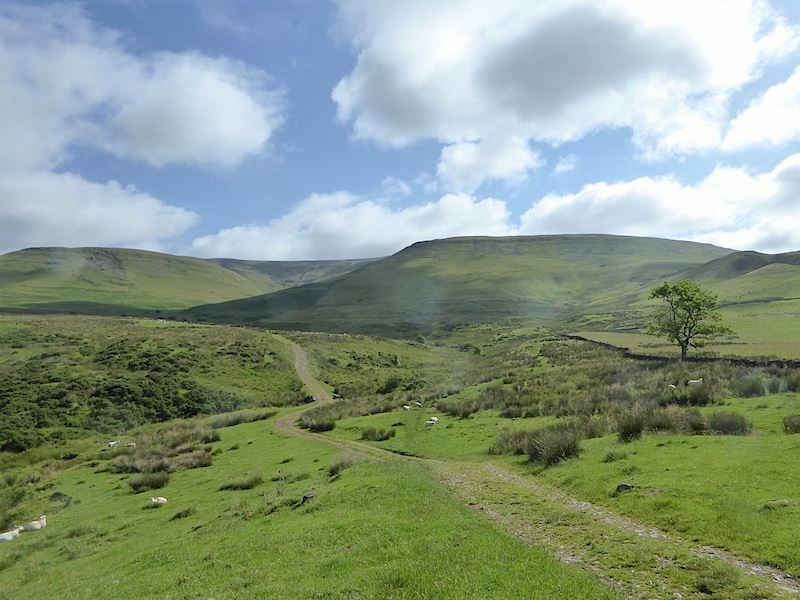 The Pennine Way appears just in time since one team member (not me) was beginning to become a little threadbare with it all. About ten minutes back from this spot I heard a loud despairing groan behind me. Fearing that the injured foot had suffered some damage and that we might be into calling out the MRT I turned round to find out what was wrong. “Sodding bog, I’ve got a bootfull,” was the petulant answer to my enquiry. I knew from past experience that this ‘bootfull’ could mean anything from a wet sock top to complete immersion from the knee down, and in the event it turned out to have been nothing more than a slight sinking into a wettish patch which barely reached his bootlaces never mind filling his boots. Being of a sympathetic nature I reminded him that, even if it had been a ‘bootfull’, having wet feet is rarely terminal, that trench foot was a remote and highly unlikely consequence, and furthermore if he didn’t stop being such a grump I wouldn’t bring him on nice walks like this any more. This latter is a time honoured and light-hearted saying of mine which generally banishes any remaining grizzle. 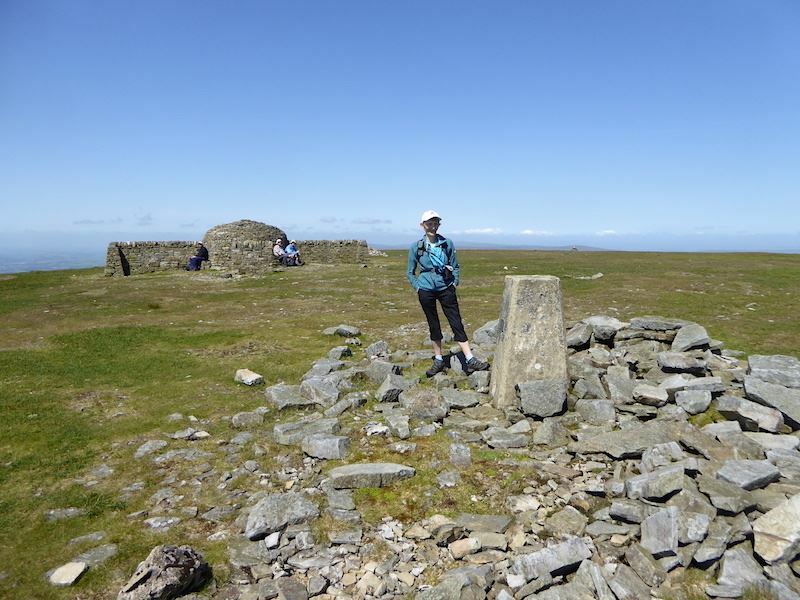 Anyway as usual I’ve gone off topic so back to the photo where, at the cairn, we turned up onto the Pennine Way and headed over the slightly soupy ground to Cross Fell summit. 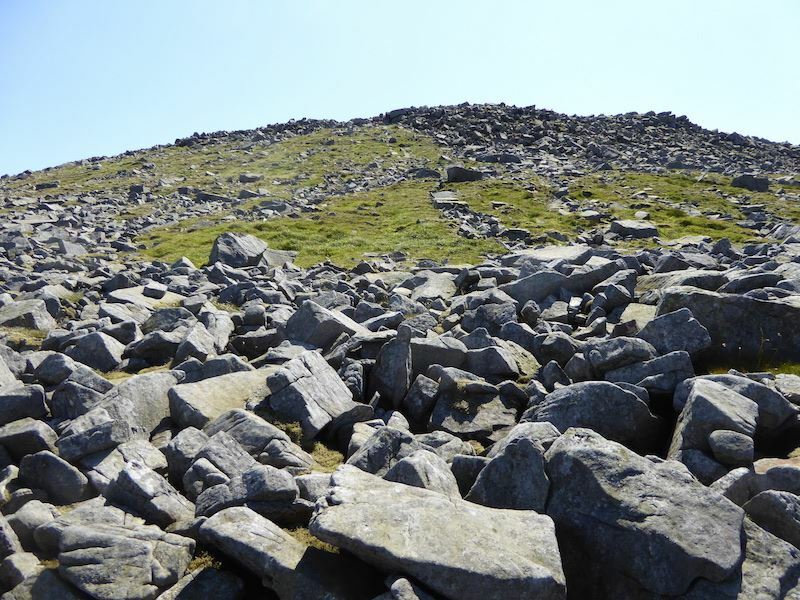 We arrive at the boulder field which surrounds the approach to the summit area pleased to see that the rocks are bone dry. The first section is a bit on the awkward side since the rocks are all heaped one against another at different angles with almost no grassy spaces showing between them. Depending on one’s confidence, agility and sense of balance its possible to step quickly from one to the other and reach the grassy area beyond in no time at all. A still dodgy ankle resulted in taking it rather steadier than that just to be on the safe side and we stuck to the grassier bits as often as possible. Once over the boulder field we had a short stop and took a look back to view the north Pennines stretching away into the distance. 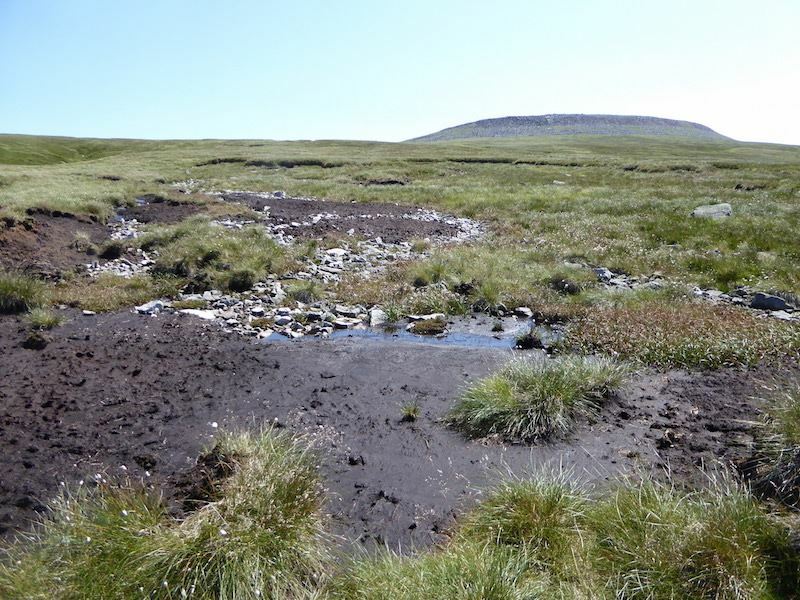 A little way to the left of the brown peat bogs below you may be able to pick out the trodden route we had more or less followed to reach the start of the boulder field. 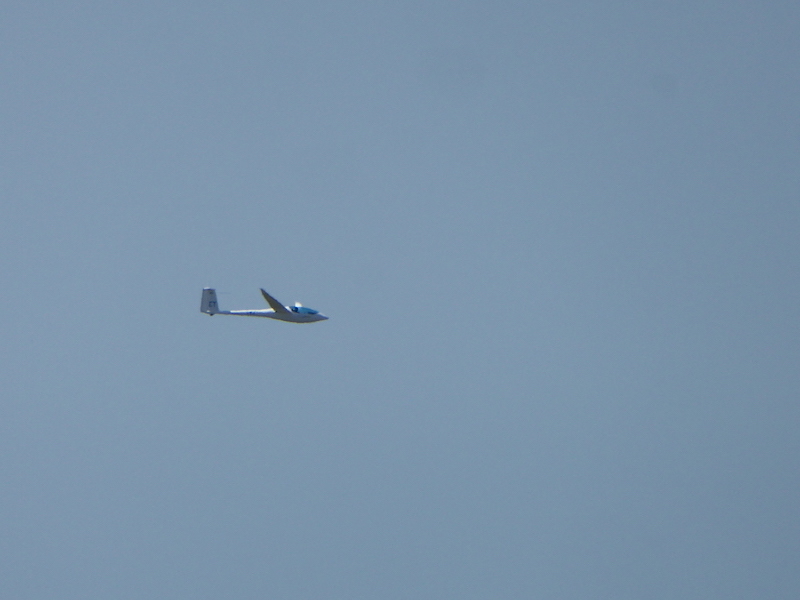 As you can see the long distance views weren’t up to much so I didn’t bother taking any. A horizon consisting of nothing but miles of hazy blue grey emulsion is nobody’s idea of a good view. 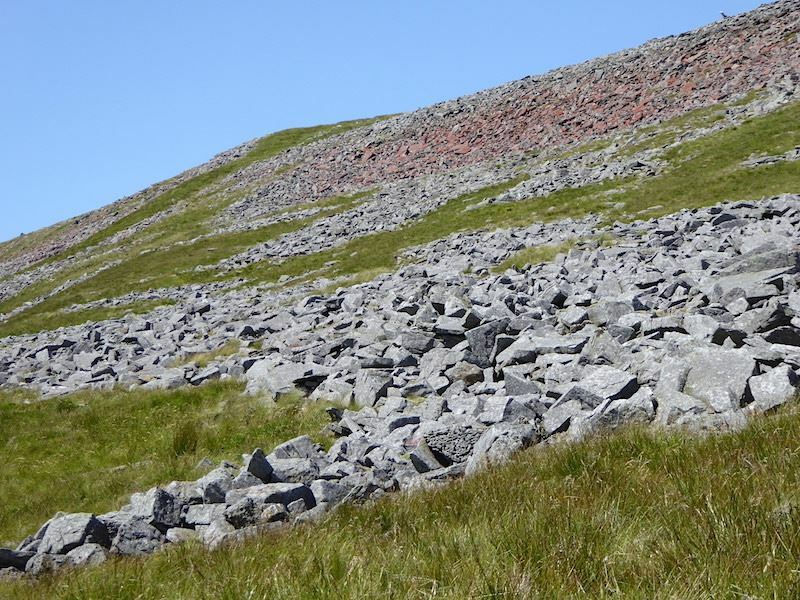 We reach the and of the boulder field beyond which is the grassy path leading up to the cairns and eventually the summit plateau. With the end, and lunch, in sight the mood is light hearted so we complete the obstacle course and make our way over to the cairns. 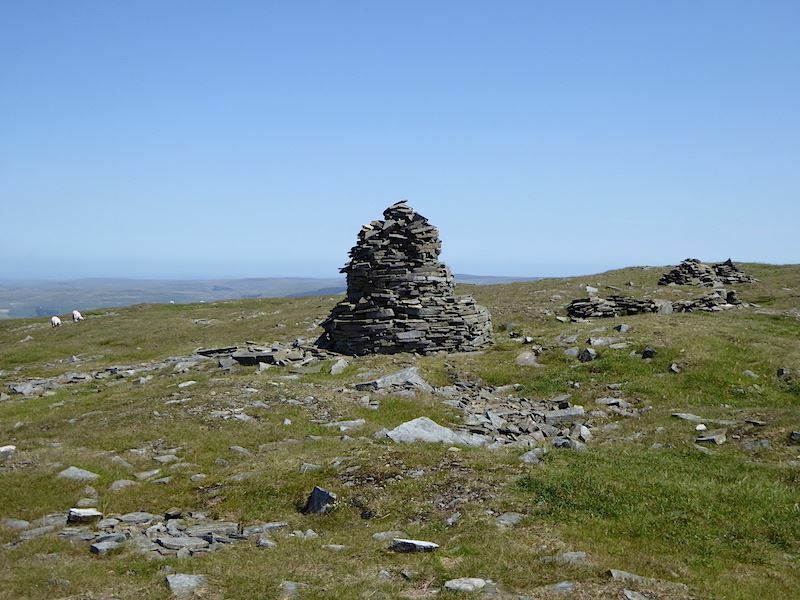 Looking rather like a poor imitation of Nine Standards Rigg is this line of four cairns, only one of which remains in anything like its original state. Whether all four would have been built at the same time and would have looked broadly similar I can’t say. Maybe there was just the large one to begin with and down the years other folk have made an amateurish attempt at adding more. I expect the wild winds and weather up here have played a big part in their present pitiful state. 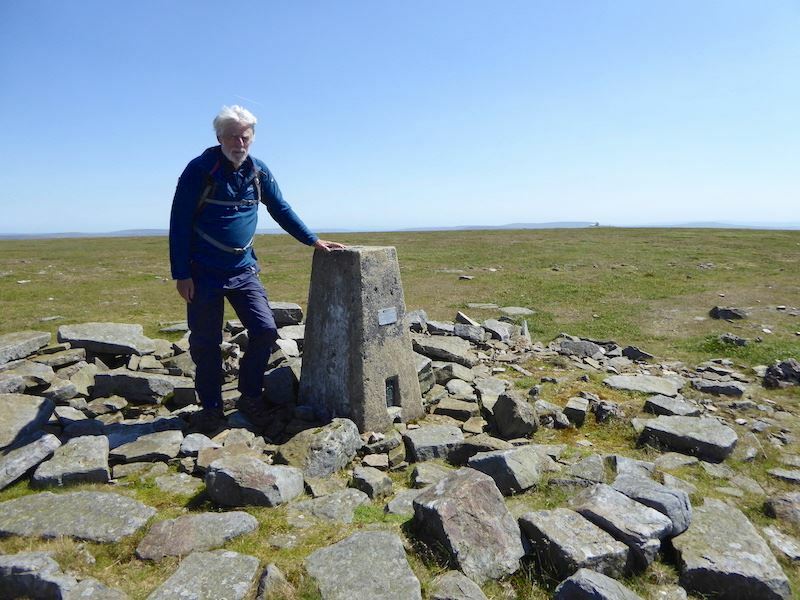 Finally we set foot onto Cross Fell’s sprawling plateau and the sight of a sturdy and unoccupied cross shelter hastens our steps to bag a seat on a side out of the now very breezy and coolish wind, We end up sitting in the left hand section out of the wind and facing the sun, jumpers are added to retain body heat and food boxes and flasks are retrieved from our packs. 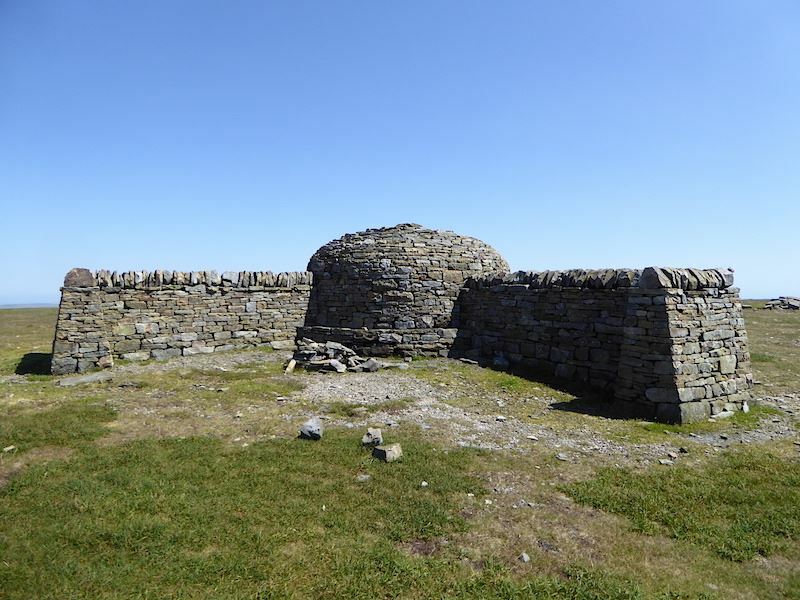 This is a magnificent and very sturdy shelter, and having seen some before and after photos, it seems to have been rebuilt some time between 2014 and 2016. 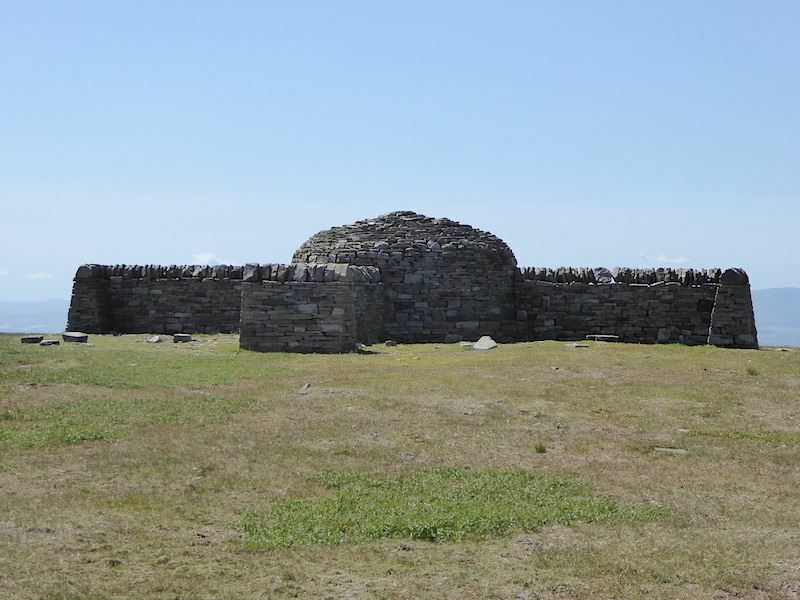 In May 2014 the previous one was in a bad state of repair with the central section having been damaged over the years by winds, snow, ice and rain until it finally collapsed into a heap of rubble. By June 2016 it had been replaced by the one which stands here at present. Each section of the central dome section has built in seating, with the cross walls being long enough and sturdy enough to accommodate even more walkers when the seating areas are taken. 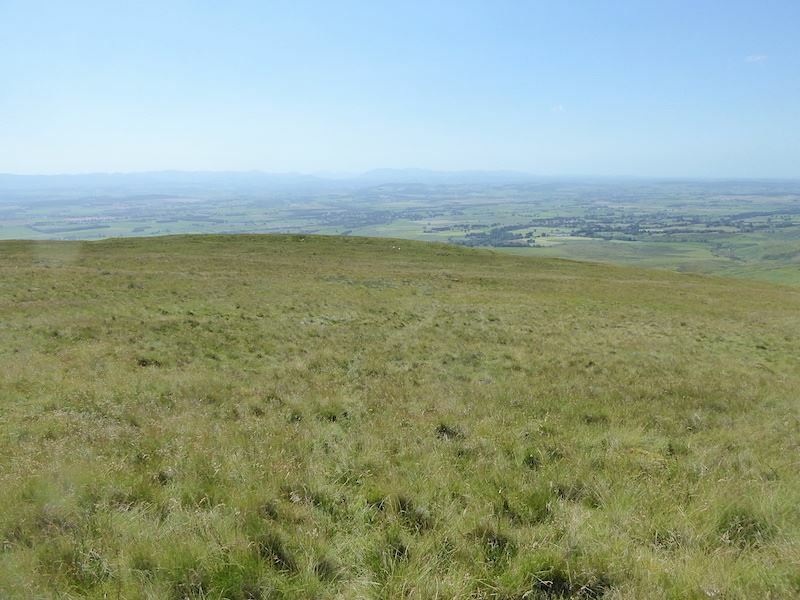 A four star shelter where we had a very pleasant lunch break and looked out across the vast summit plateau. The lone walker who had arrived from the distant marker cairn is still on the left of the shelter eating his lunch, and as we were packing up to get on our way again the two gents to the right of him turned up, took up residence in the shelter where we had been sitting and had a chat with us. 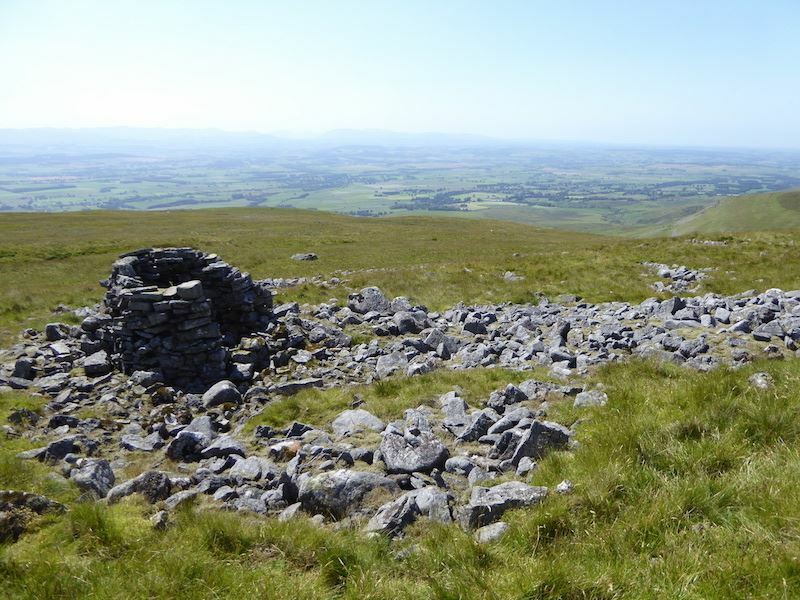 They had walked up from Garrigill down in the Teesdale area on the eastern side of the fell, a seven mile walk from there to the summit. They were a couple of elderly gents who didn’t appear to be all that sprightly. I didn’t ask but I wondered how long it had taken them to get here and how they had got on across the boulder field. They were an unusual pair, definitely the old school kind of walker who had quite obviously never seen the inside of an outdoor clothing shop for several years, if ever. One of them was even wearing lace up brown leather brogues, the kind that men used to wear with a suit. They wouldn’t have looked out of place alongside AW in his customary walking outfit, however as they were addressing each other by their surnames with cut glass accents I wondered what the the plain speaking lad from Blackburn would have made of them. 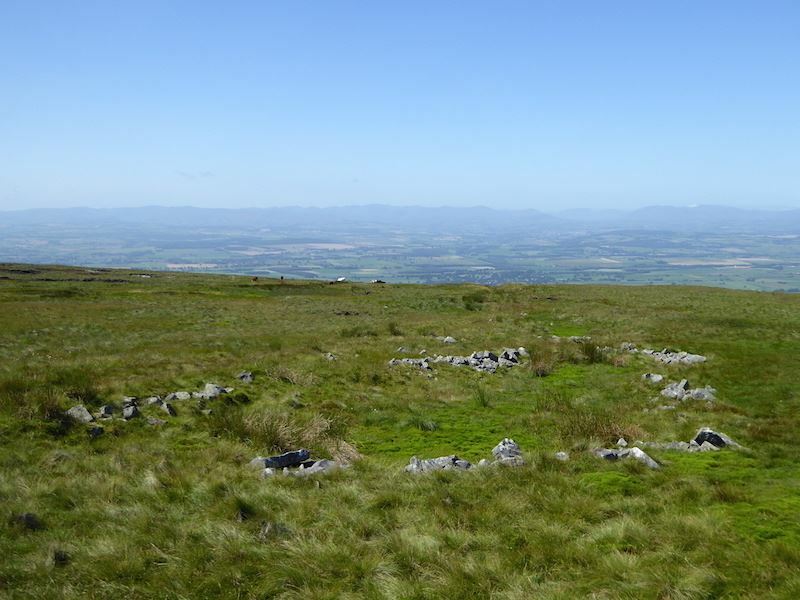 They were completely relaxed, practically verging on the nonchalant, about where they were going next and asked us if we were going on to Great Dun Fell. We were asked just the same question a few moments later by the lone walker, a much younger man than them, somewhere in his late twenties/early thirties, who did at least have a map. The two gents had nothing of the sort so out came ours for them to have a look at so they could at least commit a few nuggets of information to memory. 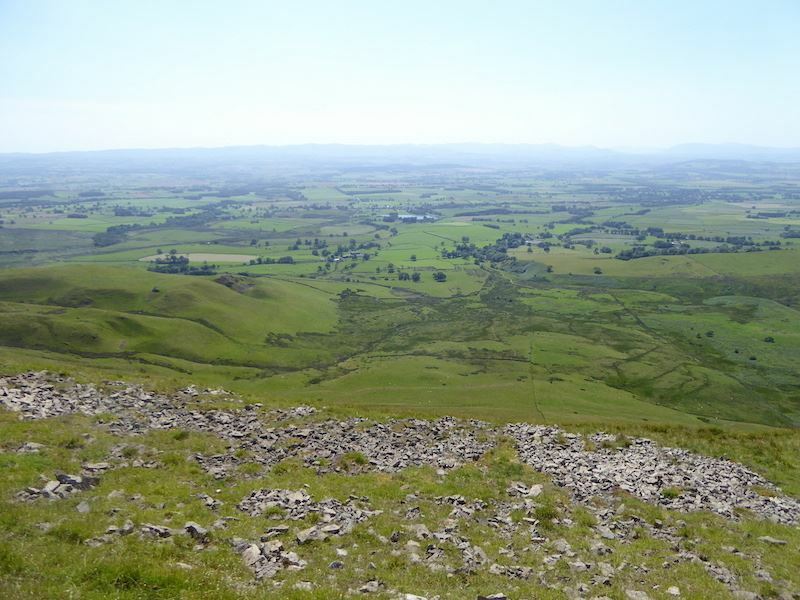 One of them even mentioned going on to Dufton Pike. 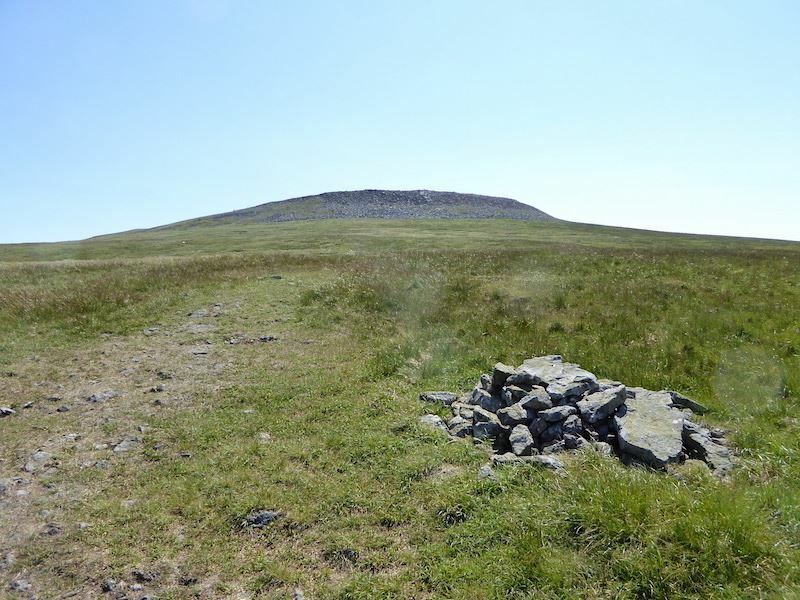 My heart sank, if they went over to Great Dun Fell and then walked all the way down to Dufton Pike they would end up in the Eden Valley, miles and miles away from Garrigill, not to mention the small matter of ending up on the western side of Cross Fell having started out on its eastern side. 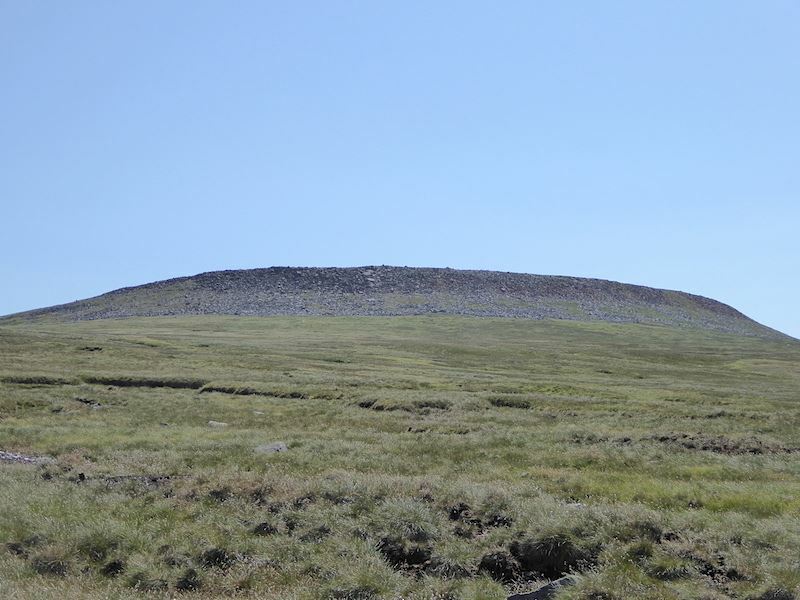 We took our leave of our summit companions and walked south eastwards across the plateau with the Civil Aviation Authority radar domes directly ahead of us all the way across. On a bright sunny day the white golf ball can be seen from many a Lake District fell. We dropped down through the boulder field again to take an off path route down the grassy slopes to make our return to Kirkland. 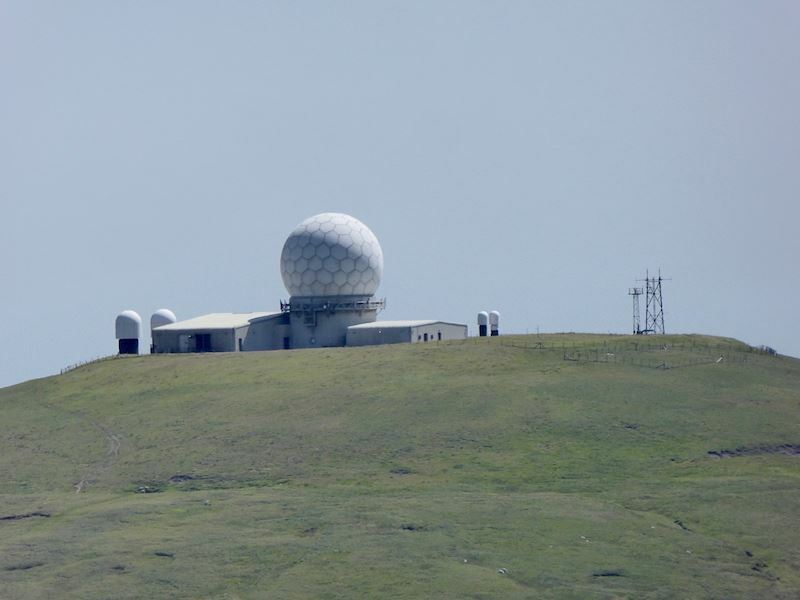 A closer look at the radar station and its dome before we leave it behind. As we lose height I take a look back up at the bouldery perimeter guarding the approach to the summit. Here the majority of the boulders are red, probably red sandstone but as I’m not a geologist that’s only a guess. Strangely there was none of this red rock anywhere amongst the boulders we clambered over at the north western end of the fell on our way to the summit. It isn’t only confined to just that one patch either, it continues all the way along the western perimeter. More questions spring to mind together with all manner of explanations and possibilities, none of which included spirits, evil or otherwise. There will be a logical and rational explanation for it but I don’t know enough to work out what it is. 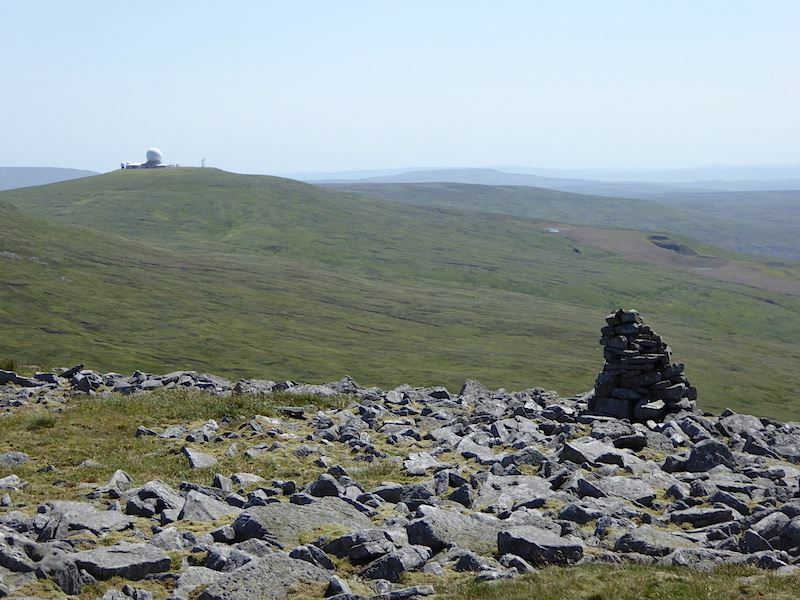 As I looked back at Little Dun Fell and Great Dun Fell I noticed the young man from the shelter making his way across the rocks to continue his trek over to the radar station. There was no sign of the two gents who were probably still enjoying their lunch back at the shelter. 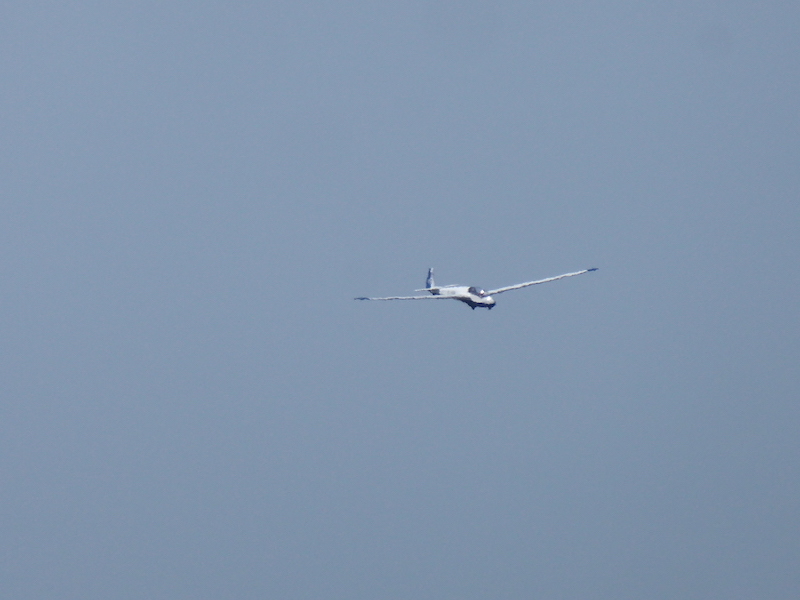 High above us a couple of pilots in their gliders were spending the afternoon riding the thermals …..
….. and they were still effortlessly soaring high above us when we rejoined the bridleway back to Kirkland. There is no path marked on the map for the descent route we took but surprisingly we did come across one, quite narrow but well trodden and with boot prints visible every so often so we made good use of it. It would disappear at times when we came to yet another of the many boulder fields across here, but it always turned up again, seemingly out of nowhere. 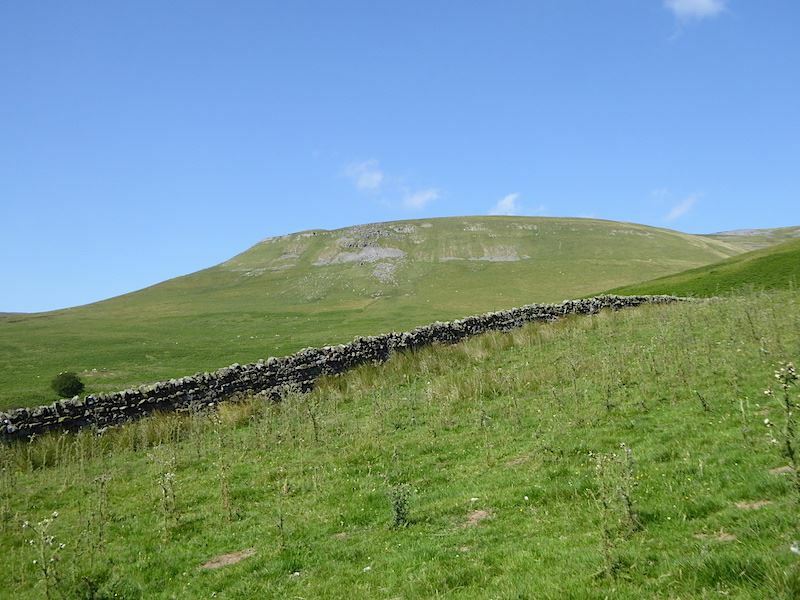 Below us is Dufton Pike which one of the two gents at the summit had mentioned for a possible visit. I really hope they didn’t do it if they were planning on returning to Garrigill. 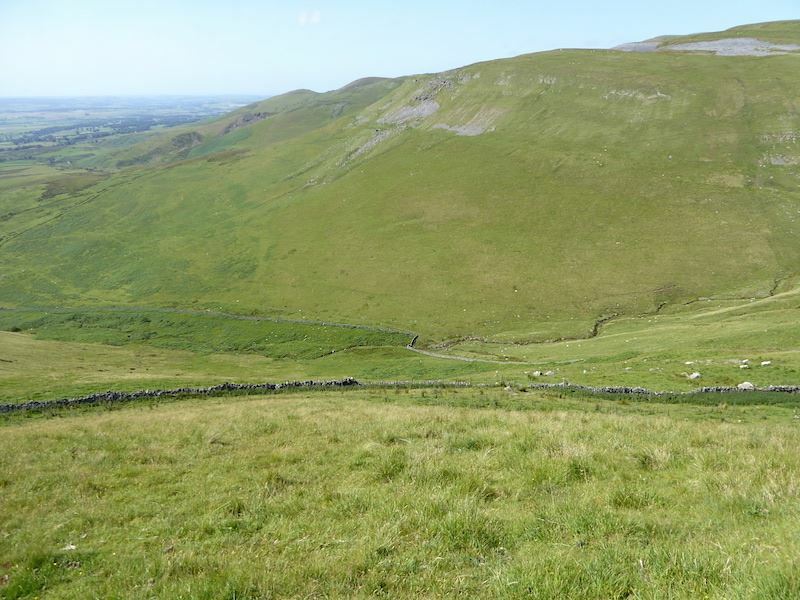 On the other hand, although I didn’t hear them mention it, they may have been walking the Pennine Way. If that was the case then they could follow it all the way down to Dufton and fit in a quick nip up Dufton Pike before reaching the village. The chances of either of them doing a quick nip up anything were remote, given their laid-back demeanour, but given the long hours of daylight they would have the time to stroll up the Pike and then drop down into the village for a pint and an evening meal before flopping into their chosen B&B for the night. I hope that’s their plan and I hope they made it safely to whatever destination they had in mind. Still making our way down and Blencarn Lake is back in view but the view across to the Lake District fells is as murky as ever. 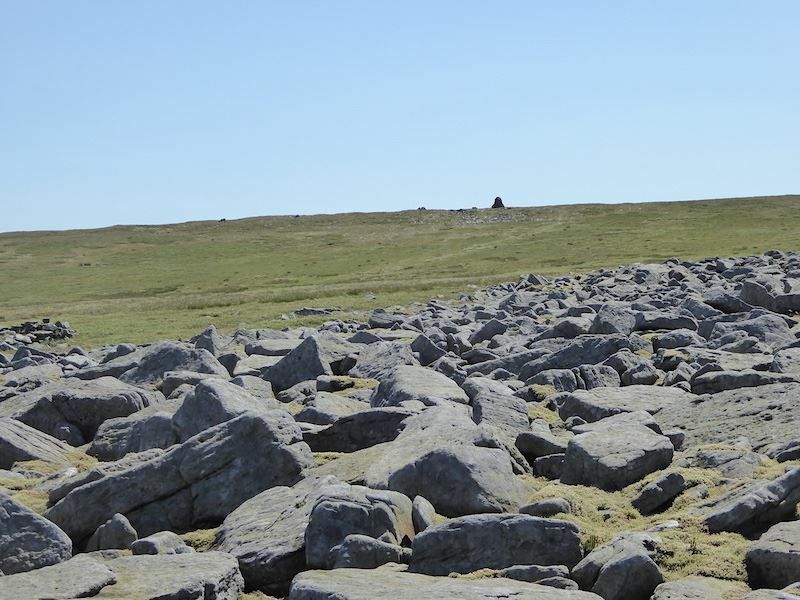 The boulder fields aren’t finished with us just yet and the long escarpment of Grey Scar looks like quite a formidable obstacle …..
….. and once across this initial jumble there is a fair sized drop below that line of rock going across the middle of the shot. 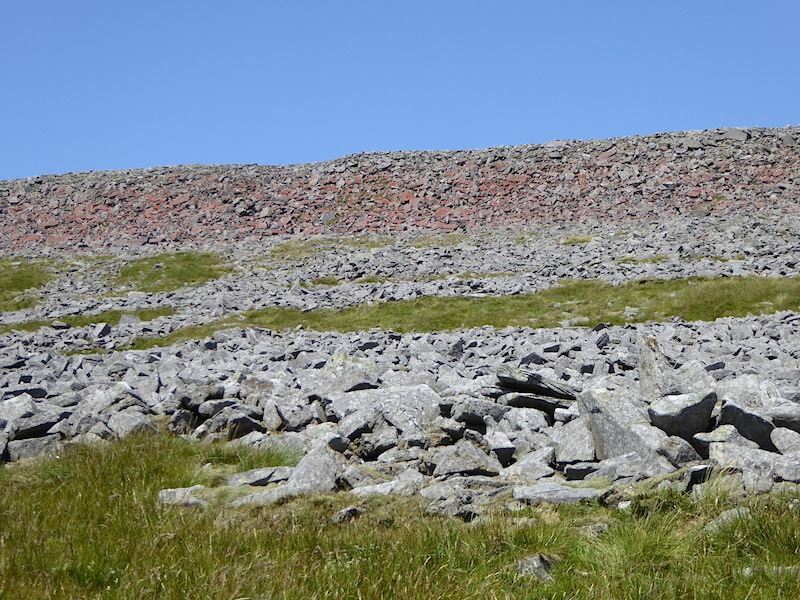 Before we start the drop down from Grey Scar I took a last look back up at the reddish boulder field surrounding Cross Fell’s summit. 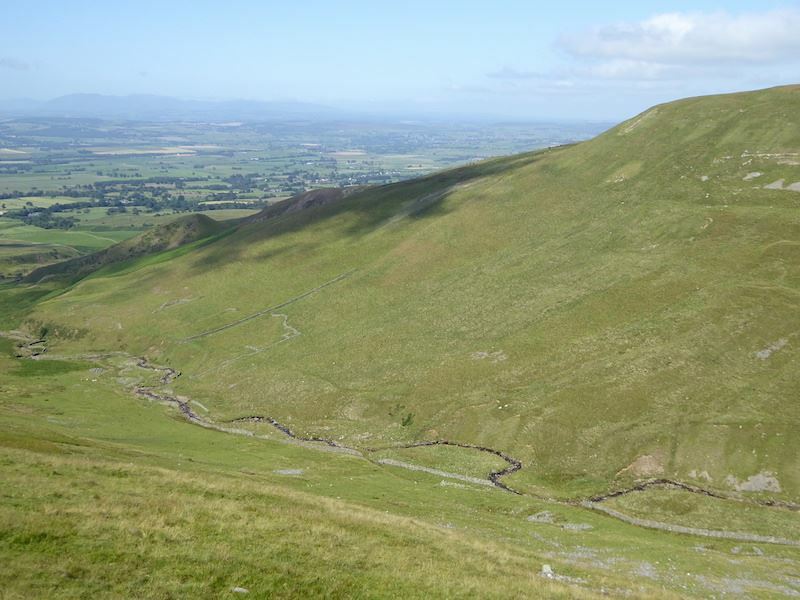 Once again the little path winds its way around and past the rocks and tips us out on the grass below Grey Scar. 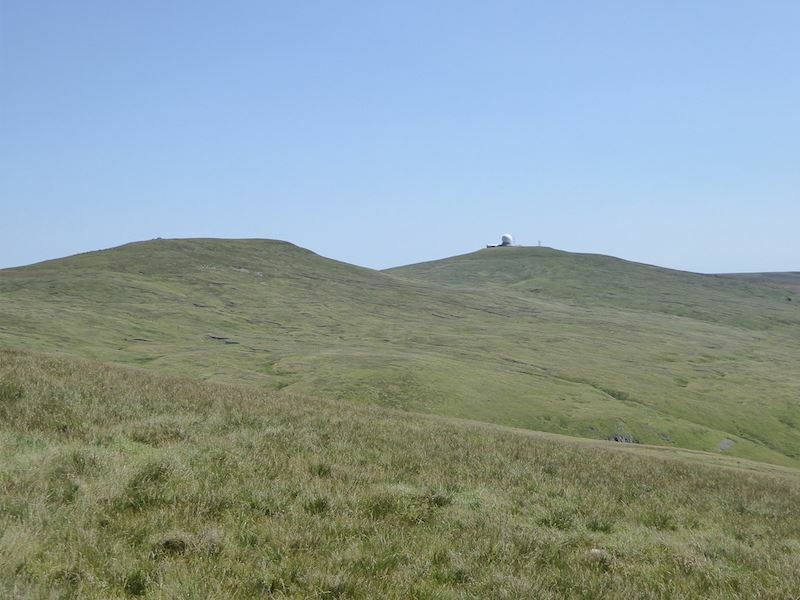 The summit of the fell is now completely hidden by Grey Scar. Further down we came across this unusual little shelter smack in the middle of nowhere. 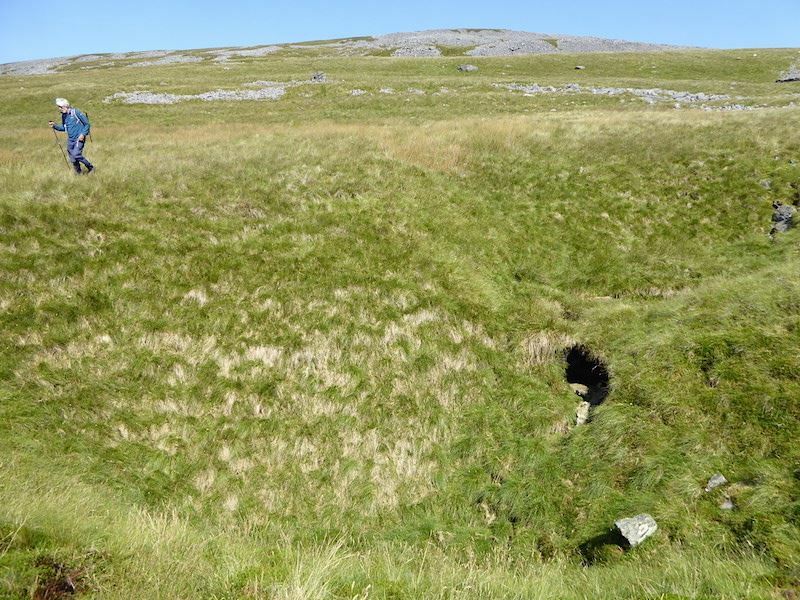 It would be a squeeze to fit two people in it but comfy enough for one so we thought it might once have served as a shepherd’s shelter, especially as very close by was …..
….. this derelict sheepfold and the obvious absence of any other structures. Rounding one of the many shake holes peppering the slopes with a view back up to Grey Scar. 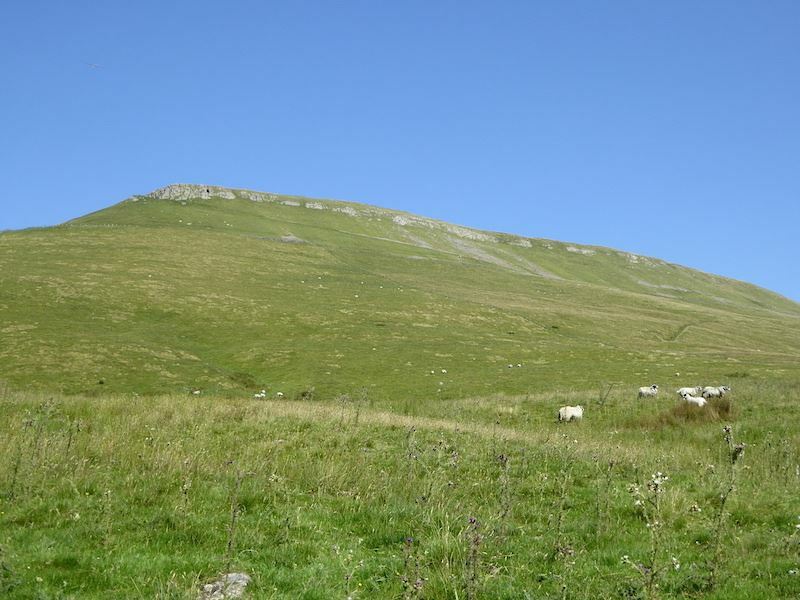 Another view up to Grey Scar as we continue to plod our way down the thin path. The summit breeze is long gone and the sun is blazing down from the clearest of blue skies. Its a beautiful afternoon for a steady tramp down a grassy, and surprisingly dry, moorland fell side. 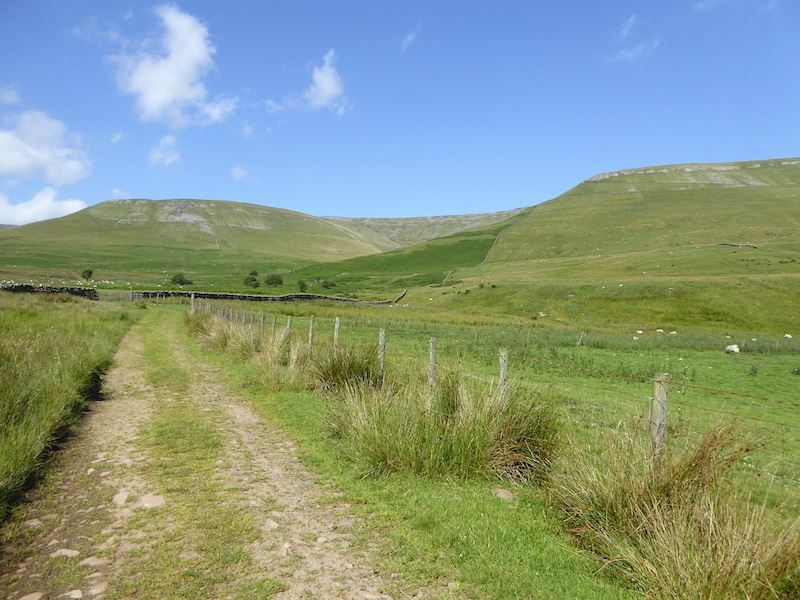 The view ahead of us as the path joins up with the twin tracks of a quad bike which leads us down to Wildboar Nook …..
….. and over on our right are more patches of limestone scars across the head of Kirkdale. 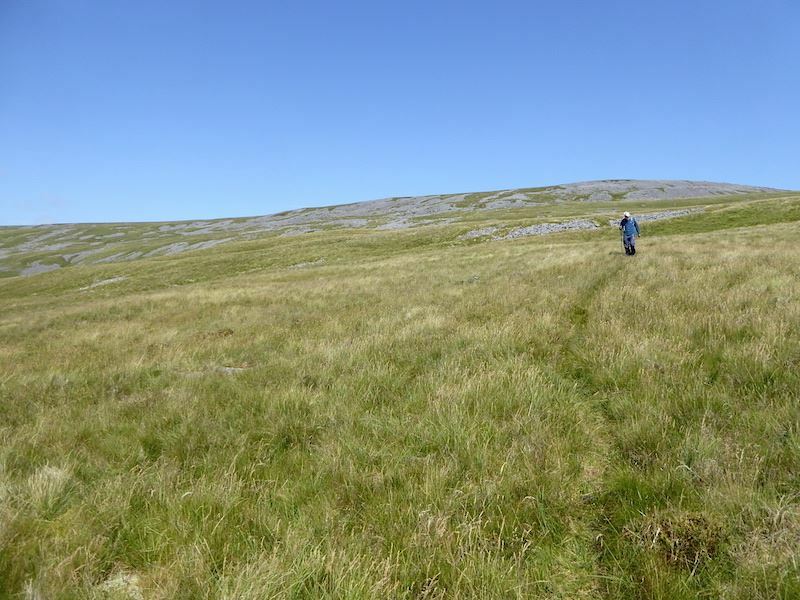 Arriving at Wildboar Nook below which is much too steep a rocky drop to even begin to think of descending with a dodgy ankle …..
….. so we descend to the wall via the steep grassy route at the end of it. On the left is the grassy slope we used to descend and once through the gate in the fence I stopped to take this shot of Wildboar Nook. I think its obvious why we opted for the grassy descent route. Looking down from the same spot and knowing that the still dodgy foot will definitely not be happy going down here but there’s no other option, what goes up must eventually come down somewhere, somehow. Once we were down the very steepest slope I took another look back up to the Wildboar escarpment. On the right hand side of us is High Cap which we walked around and up at the start of today’s walk. 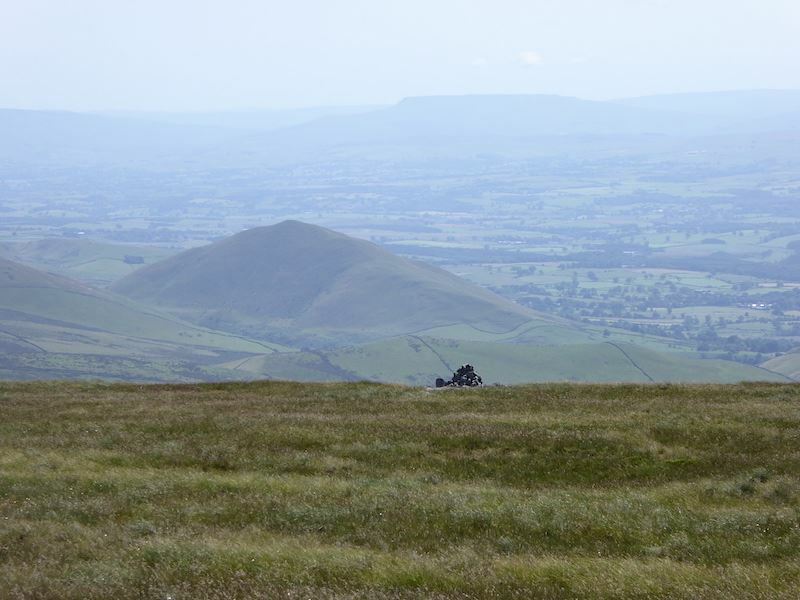 ….. and then the sweep from Wildboar Scar down to Grumply Hill …..
….. and finally, from the bridleway, a last look back at the first good view we had when we set out this morning. The bridleway morphs into the rough farm track again as we head back to Kirkland. As I suspected the dodgy foot did not take kindly to that steep descent and is now feeling very much under the weather. The rough track wasn’t helping matters either, but its no great distance back to the car and then a chance to sit and give it a rest. Before we drove away I thought a shot of St Lawrence’s Church in the afternoon sun would make a fitting final picture. 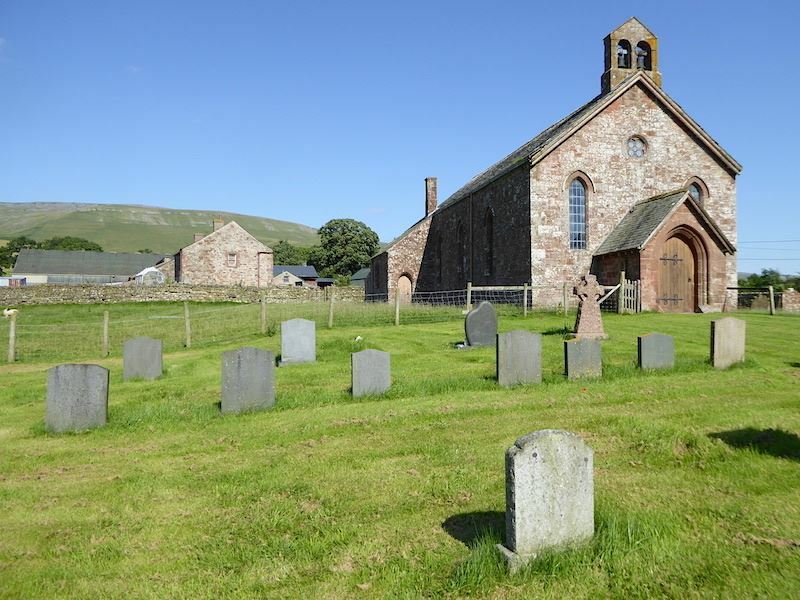 It just seemed to sum up the day, lots of green grass, lots of blue sky, lots of sunshine and, apart from the gentle rustle of flowers being removed from their wrapping by a lady tending a grave and a bird or two calling out, not another sound. A great walk and a great day in which to enjoy it.